Explore the rich history of the Smithsonian Folklife Festival through our material culture collection. Each object holds a story of community, tradition, collaboration, and conversation, bringing to life the spirit of the Festival as a celebration of traditional cultural heritage. 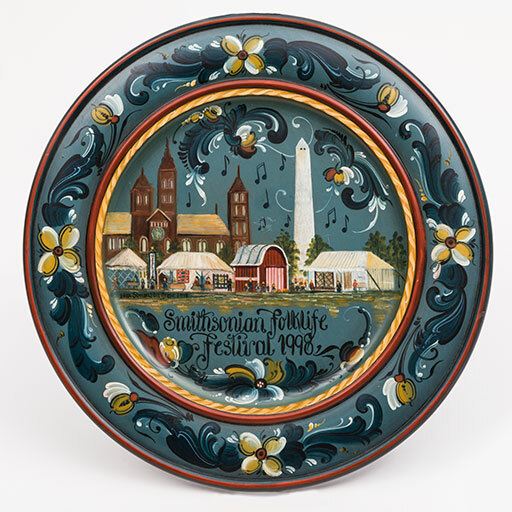 From chainsaw carvers to Southern potters, religious scroll painters to silversmiths, participants in the Smithsonian Folklife Festival have created a remarkable array of storied objects as they’ve discussed their cultural traditions with the public. Sometimes, near the end of a Festival, they present these objects as gifts to the Center for Folklife and Cultural Heritage. 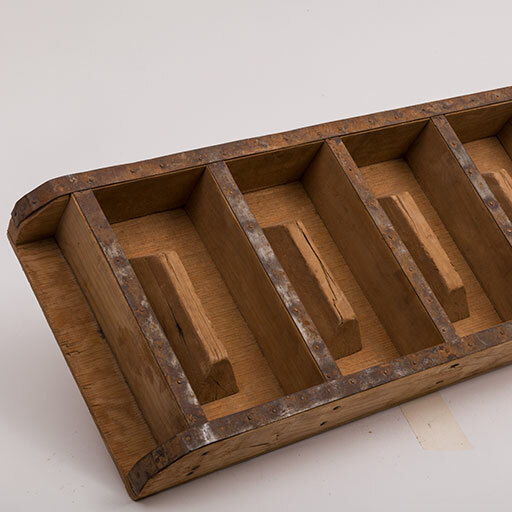 The resulting material culture collection has grown to more than 800 objects. Unplanned and unexpected, it is beloved by staff. It is also essentially unknowna hidden treasure within a research unit of the Smithsonian. Yet thanks to the memories of staff, the eloquence of the artists, and the Ralph Rinzler Folklife Archivesthere is much to learn from these storied objects. Matteo Valderrama, 2015 Perú: Pachamama program. Melissa Darden, 1996 The American South program. 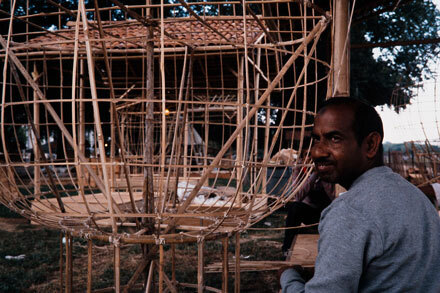 Bamboo craftsmen, 1985 Mela: An Indian Fair program. John Neilson, 2009 Wales Smithsonian Cymru program. 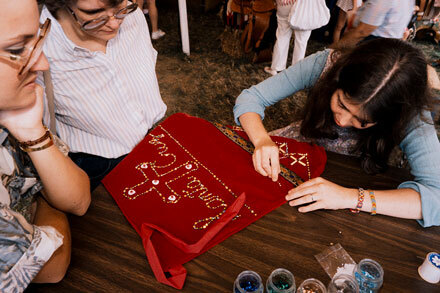 A young family member works on María Teresa Gonzáles’ dance skirt, 1987 Cultural Conservation and Languages: America’s Many Voices program. 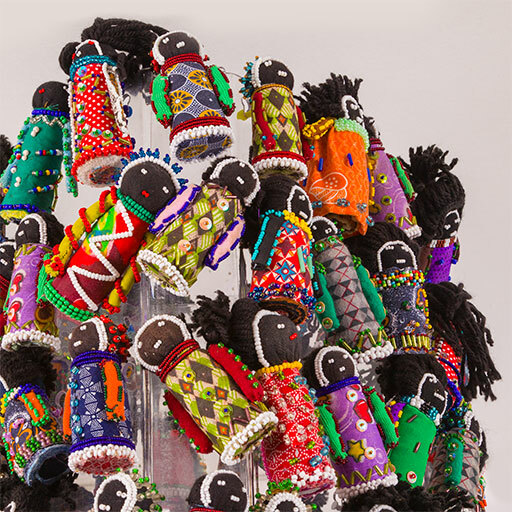 The fifty selected objects were made by traditional artists from around the world during more than thirty Festival programs. Instead of presenting one object from each year, we looked for objects that tell a good Festival story. What added something can we learn about a particular object and its maker because of its Festival origins? It turns out quite a bit! 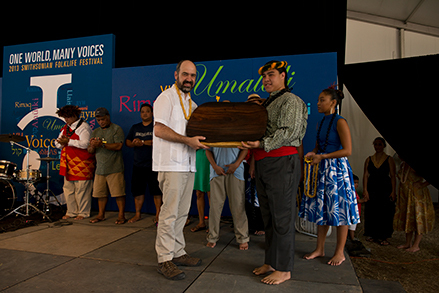 Center director Michael Mason receives the poi pounding board, 2013. 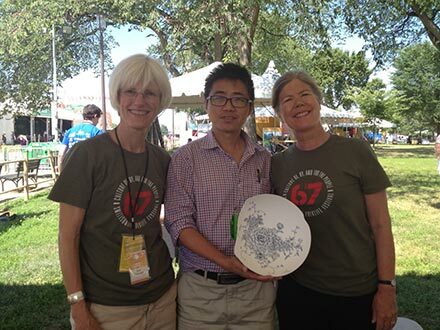 Sun Lixin presents his porcelain bowl to Erin Younger (left) and Marjorie Hunt (right), 2014. 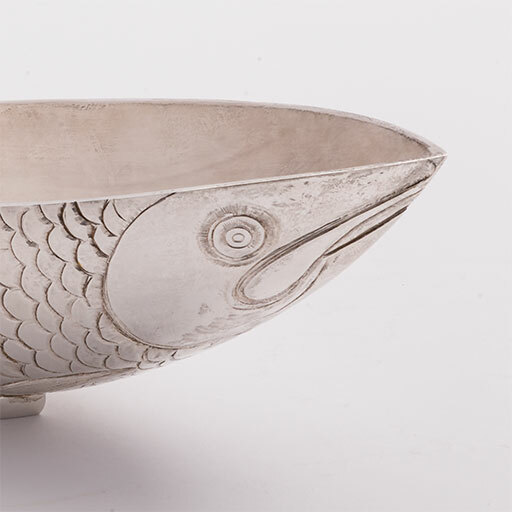 Graham Stewart described the silver vessel he made at the 2003 Folklife Festival as a “simple salmon shape so kids could understand straight away what I was making.” His modest manner belied his reputation as one of Scotland’s leading silversmiths. A common thread for Festival participants is the mutual admiration that grows between them—both across programs and within them. Countless artists have said they learned so much about their own countries, cultures, and traditional heritage by meeting and listening to their fellow participants. For Stewart, the experience of listening to Scotland’s finest musicians all in one place was a thrill of a lifetime. His experience following the music mimicked the migration story of his bowl. He made his own migration, traveling halfway across the world (and back again) to hear the great musicians of his homeland. Graham Stewart begins work on the salmon. The construction of a Bhutanese temple (lhakhang) on the 2008 Festival grounds started with a cultural negotiation—it needed to be modified to accommodate an accessibility ramp. This was a foreign concept to the builders, but they quickly embraced it. This section of railing was removed for the ramp and later donated to the Center. The 2008 Bhutan program introduced Festival visitors to a little known part of the world at a time when Bhutan was transitioning to a constitutional monarchy. The lhakhang was the centerpiece of the program and became an irresistible draw. 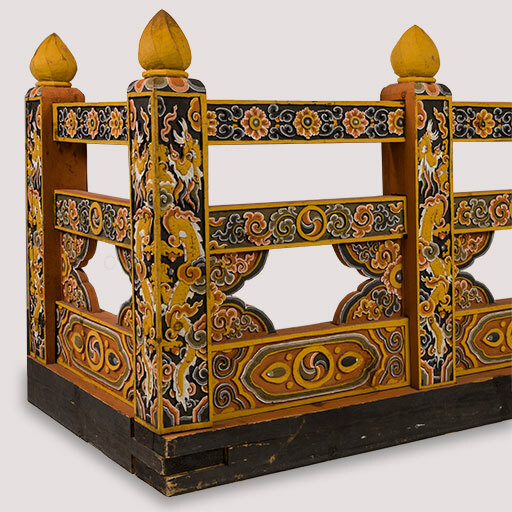 Its architectural elements were created in Bhutan, packed and shipped to America, and then carefully assembled into this country’s first authentic Bhutanese building. When completed, monks welcomed visitors into the temple. Its interior dazzled, and visitors knew they had entered a special place when they passed over its threshold. Artisans paint the interior pillars of the lhakhang in Bhutan. An interior wall section is assembled before shipping to the U.S. The section is set into place on the National Mall. Rainbow over the temple and Smithsonian Castle. Visitors often wonder what happens to the large temporary structures erected each year during the Festival. In the case of the lhakhang, prior arrangements had been made to move the building to the campus of the University of Texas at El Paso. Why there? A devastating fire had destroyed the original buildings nearly a century earlier, and the campus was rebuilt in a style reminiscent of Bhutanese architectural design. University planners were inspired by the April 1914 issue of National Geographic, which featured the distinctive whitewashed buildings of Bhutan, set in a hilly, arid terrain similar to El Paso. The reconstructed lhakhang now stands at the center of the university’s Centennial Plaza. Its highly decorated exterior and interior have been fully documented and described, and the building is open to the public by appointment. Images of the reconstructed lhakhang at the University of Texas at El Paso. Karma Wanghuck oversees the lhakhang’s construction at the Festival. 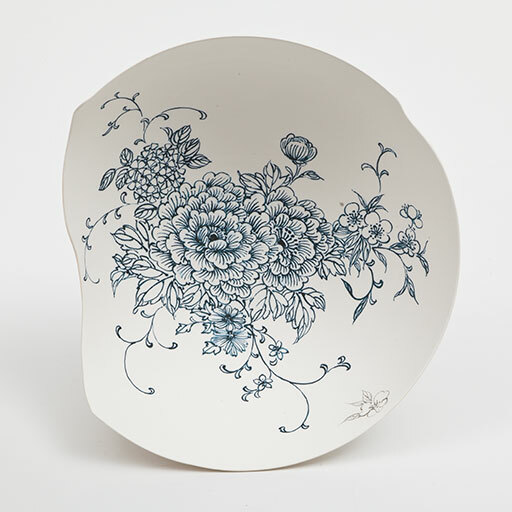 Rosa Jeréz is from Ráquira, Colombia, a town in the Andean Highlands known for its exceptional clay and, consequently, its ceramicists. The main market square in Ráquira is lined with pots, plates, and vessels in the clay’s rich orange hue. Rosa comes from this lineage of artisans. Her mother was a potter, but it was expensive to get her pieces fired, so the family turned to cattle farming and basket making for a living. As Rosa got older she was inspired by the sculptures of saints she saw in the churches. Over time, after much trial and error, she developed her own style and technique for fashioning virgins, churches, and other figures inspired by the faces and clothing of the people she encounters in her daily life. The artistic value of her work and the Andean characteristics of her virgins are now well known throughout the traditional arts world in Colombia. But this was not always the case. The first time an artisan buyer from Bogotá came to view her work, she told Rosa that her virgins were jarrapastrosas—crude and grotesque. 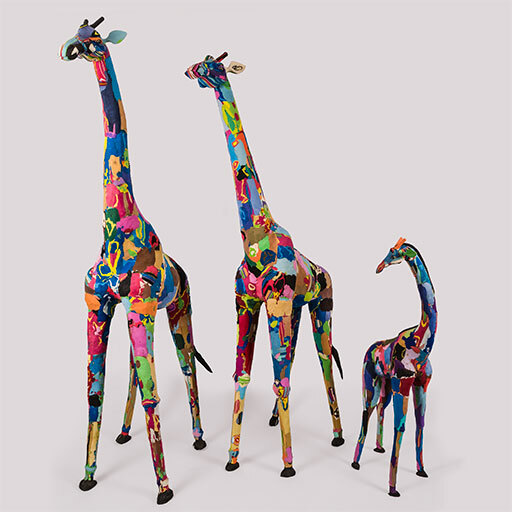 Undeterred, Rosa continued to fill her home with her hand-formed figures. Eventually another buyer came and saw the beauty and artistry in her work. 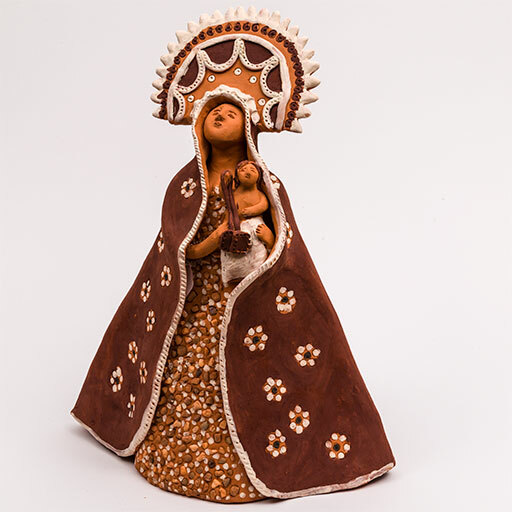 Now she’s been working with Artesanías de Colombia for many years, and her sculptures are consistently shown at folk art exhibitions and craft expositions. Rosa Jeréz works on the “Virgin of the Mall”. Detail of the Mall pebbles Rosa used to decorate the skirt. 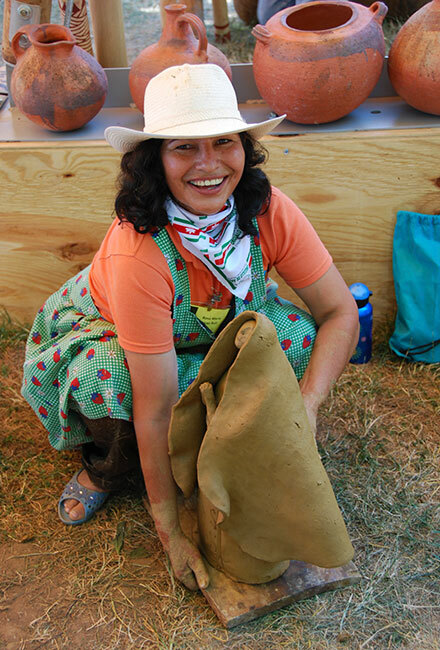 At the 2011 Folklife Festival’s Colombia: The Nature of Culture program, Rosa hand-molded figures from Ráquira clay for the visitors who would congregate around her. As usual, she looked to her surroundings for inspiration: when it was time to decorate the skirt on the figure shown here, she adorned it with pebbles she found on the pathway near her presentation area. 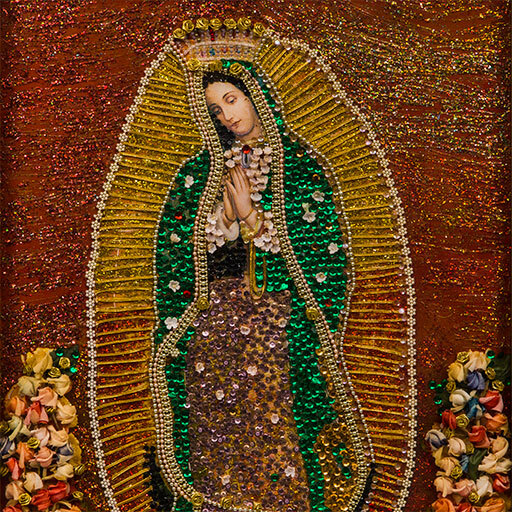 The result is fondly called the “Virgin of the Mall” and was a welcome addition to the Center’s collection, marrying Rosa’s traditions and techniques with the environment of the National Mall. Rosa Jeréz carefully moves the unfired virgin. A forty-foot-high effigy of demon king Rāvana rises up on the Festival grounds. “On the last day of Mela! the effigies of Rāvana were burned. 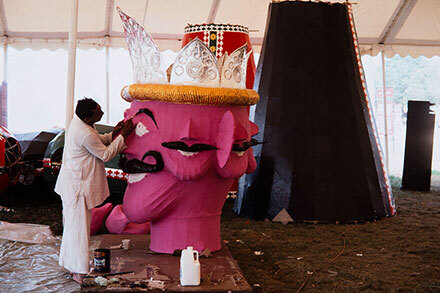 Inside that fire, when the effigies were burned, all the bad things that were inside of us were thrown into that fire.” So sang Banku Patua in West Bengal when showing villagers his painted story scroll of the 1985 Festival. The story of the victory of Lord Rāma—who rescues his kidnapped wife Sita from the ten-headed demon king Rāvana—is reenacted each year throughout India during the ten-day Hindu celebration of Dassehra. 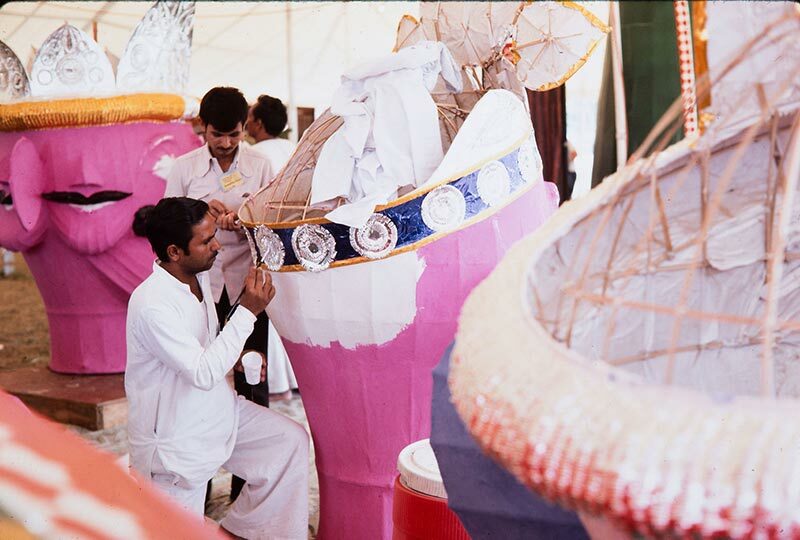 At the 1985 Festival, the drama unfolded in the center of Mela! An Indian Fair. A melā is a combination bazaar, street fair, and cultural festival that people travel far and wide to attend. At the composite melā in Washington, D.C., visitors were immersed in the sights, sounds, smells, and rituals of regional India. An outdoor “Learning Center” housed a performing space and workshop area devoted to ritual activities. 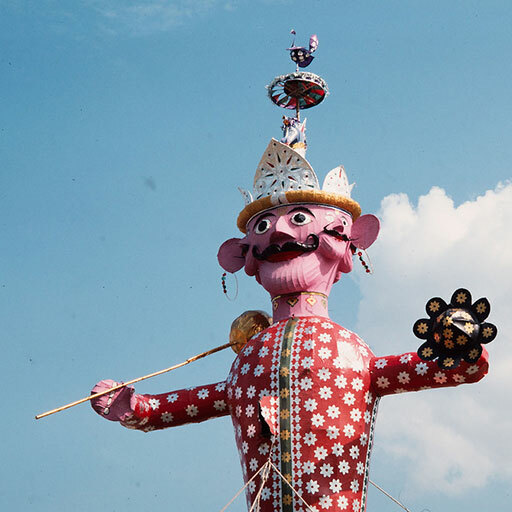 There, Jamil Ahmed, Bal Mukand, Gopal Singh, and others from Uttar Pradesh worked to create the towering effigies of Rāvana and his allies, son Meghanada and brother Kumbhakarna. Visitors watched them carefully split and tie together the bamboo sticks that formed the structure of the flamboyant characters. These forms were then covered with papier-mâché, brightly painted, and embellished with oversized jewels. Once finished, the effigies were laid out on the ground, securely assembled, and raised by ropes to their upright positions. The three effigies rising up on the Mall, where they will stand until their confrontation with Rāma. On the evening of July 5, the epic confrontation between Rāma and Rāvana took place on the National Mall. At the drama’s climax, Rāma shoots a blazing arrow into the demon king, who explodes into flames. It is a noisy conflagration—all three effigies are packed with firecrackers. In the end, good triumphs over evil, and the audience is cleansed in the process. The epic battle between Rāma and Rāvana begins with the giant effigies being shot by a flaming arrow and ends with a bonfire across from the Castle. The Mela! program lives on in people’s memories. Visitors recount their fascination watching figures emerge from the piles of thin bamboo sticks. Staff remember the complex logistics of mounting the finale—in essence a giant bonfire—on the country’s most restricted National Park. Fire trucks, firefighters, and emergency supplies were everywhere. For former Festival director Diana Parker, exposure to the distinctly non-Western practice of destroying something so exquisite for ritual purposes was both transfixing and unforgettable. A bamboo craftsman creates the structure of the Rāvana effigy. An artist paints the details of Rāvana’s face. The Smithsonian Castle and Wisconsin program site are front and center on this painted wood plate. With musical notes raining down from above, artist Jean Giese used rosemaling—a Norwegian decorative painting style—to commemorate her experience at the 1998 Folklife Festival. The 1998 Wisconsin program took place during the state’s sesquicentennial, its 150th anniversary of statehood. By focusing on the rich interplay between climate, geography, and economy—and the state’s rich ethnic diversity—the Festival brought to life a variety of Wisconsin’s regional traditions. Like so many immigrants before them, the Norwegians who arrived in the mid-nineteenth century left behind most of their traditional art practices. It took a few generations for interest in those roots to return, but when it did, rosemaling and acanthus carving, which decorated so many family heirlooms, became the focus of study and revival. Today the swirling floral patterns and abstract designs, whether painted or carved, are clear markers of Norwegian American identity. 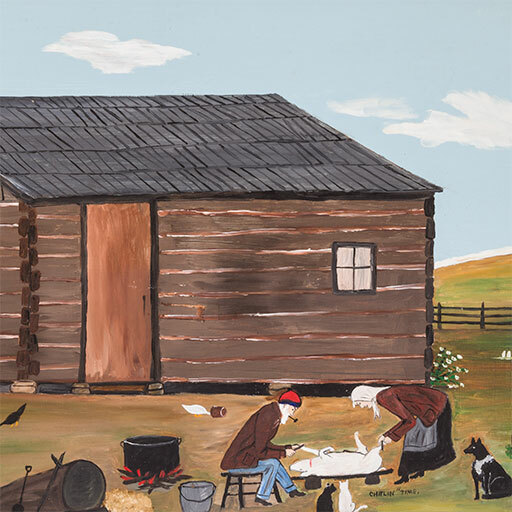 Jean Giese credited her father with encouraging her early interest in painting. He was a Norwegian immigrant who supported his family by farming tobacco. He enjoyed woodcarving and allowed young Jean to decorate his carvings. She later attended rosemaling classes at the Vesterheim Norwegian-American Museum in Decorah, Iowa, and remains active in the Norwegian cultural center in Norskedalen, Wisconsin. 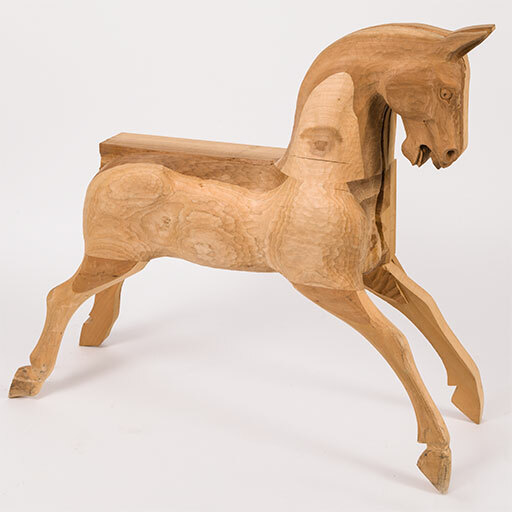 She passed on her devotion to Norwegian folk art to her daughter, who took up acanthus woodcarving with her husband. Their daughter has carried rosemaling to the new medium of cake decoration. Giese’s depiction of the 1998 Festival site realistically positions a red barn and several program tents in front of the Smithsonian Castle. The Washington Monument stands to the west and musical notes fill the sky, suggesting a lively Festival soundscape. After the Festival concluded, the Wisconsin program was restaged in Madison as the Wisconsin Folklife Festival, giving statewide audiences a chance to learn more about their own history and heritage, and honor the many people who preserve Wisconsin’s folklife. This split-wood whittling achievement perplexed and enchanted Festival visitors. 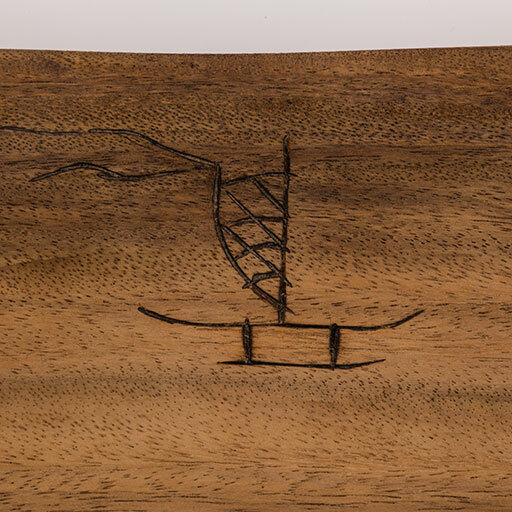 Artist William Richard perfected a wood carver’s form that originated in Europe and found a home in northwestern Maine, requiring skill, patience, and razor-sharp knives. Richard participated in the 1976 and 1983 Folklife Festivals. He enjoyed hearing visitors speculate about his methods: were the balls pre-shaped and inserted into the cages? Were the fans made of Popsicle sticks glued together? In the end, he always set them straight: the fans were carved and bent from single pieces of wood—no glue involved. Although fan towers eventually spread as far west as Oregon, the double-fan tower remained the specialty of Richard and his mentor. Today, his grandson, Rodney “Butch” Richard continues to carve them, as had Butch’s father, Rodney Richard Sr.
William Richard works on the fan tower during the 1983 Festival. Wales is a dynamic and resilient nation located to the southwest of England. Its history is filled with upheavals, and its ancient traditions have often been interrupted—not least the creation and use of Welsh instruments and tunes. The fact that these traditions have survived and the genre is thriving is a testament to a long process of adaptation, reimagining, and reclamation highlighted in the Wales Smithsonian Cymru program. Religious reforms in eighteenth-century Wales sought to discourage the use of traditional Welsh instruments, including the harp and fiddle. At the same time, church hymns sustained choral music and Gypsy musicians kept some of the traditional tunes in circulation. Today older tunes and traditional instruments are played proudly and in innovative ways by the musicians who have been shaping a future out of the past. 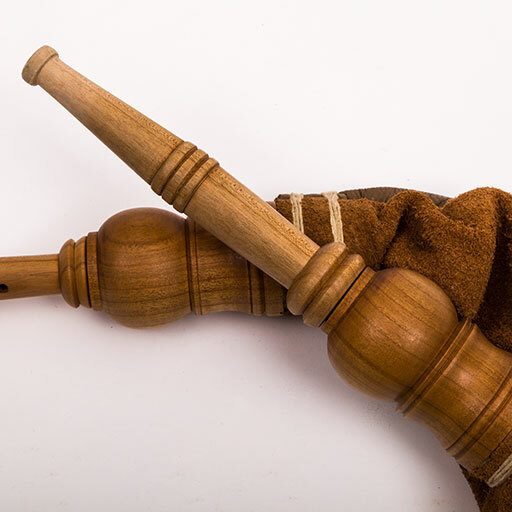 The instruments shown here are two that have made a strong comeback: the hornpipe (pibcorn) and bagpipes (piban cŵd). Their history has been traced back to the fourteenth century, but contemporary musicians had to rediscover how to make and play them. Museum collections have helped fill in the gaps: the Welsh National Museum at St. Fagan’s carefully analyzed historic examples for correct measurements and hints at techniques in their creation. Ceri Rhys Matthews plays a John Evans bagpipe with Linda and Lisa Griffiths during the 2009 Festival. For the 2009 program, our music advisors recommended John Glenydd Evans to represent instrument making. His instruments are considered some of the best made in Wales. His path to this skill was circuitous but perhaps ordained: he left school at fifteen and apprenticed as a carpenter. 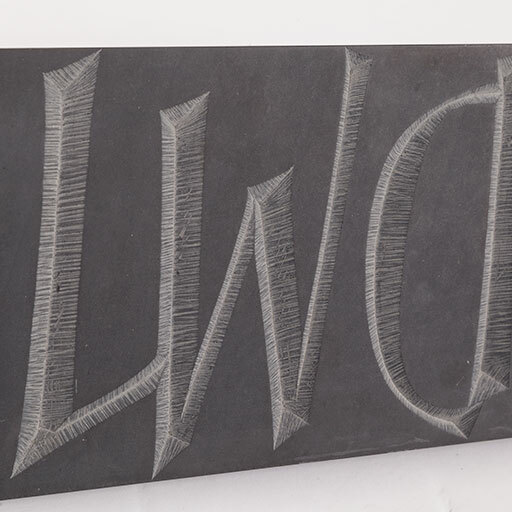 A serious accident in 1993 led him to reevaluate his life, and he decided to combine two of his loves in his work: traditional Welsh music and turning wood. The result is a catalog of in-demand instruments for the country’s finest musicians. John Glenydd Evans at the 2009 Festival. 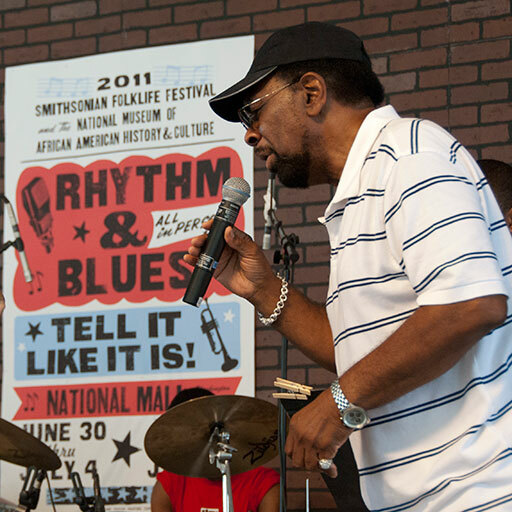 In 1983, Cleater Meaders Jr. participated in the second celebration of the National Endowment for the Arts National Heritage Fellows at the Smithsonian Folklife Festival. His cousin, Lanier Meaders, received the fellowship that year, and many in the Meaders family came to the Festival to support him—exemplifying the skill, knowledge, and multi-generational practice behind this distinctive, regional pottery tradition. 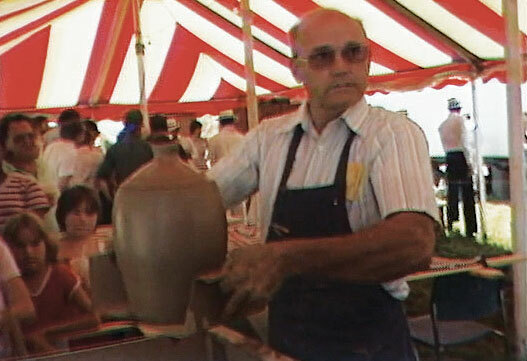 Cleater made wheel-thrown pots in the crafts tent and talked about making a syrup jug during a filmed segment preserved in the Ralph Rinzler Folklife Archives. Cleater Meaders Jr. describes his actions finishing a syrup jug as Smithsonian Secretary S. Dillon Ripley looks on during the 1983 Folklife Festival. Small-scale family-run potteries grew up in the American South during the nineteenth and early twentieth centuries. The majority of their products were utilitarian: butter churns, whiskey jugs, milk pitchers, food storage jars. The Meaders family, headed at the time by John Milton Meaders, began making stoneware in 1893 in the foothills of White County, Georgia. Making pottery was a way to supplement their farming income and also provide storage vessels for themselves. 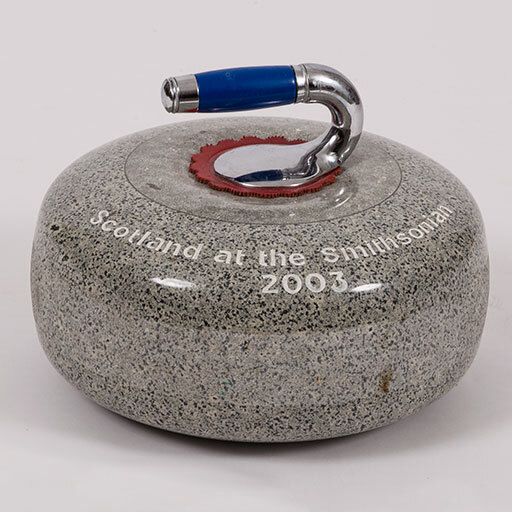 The churn shown here was signed and fired in 1984. 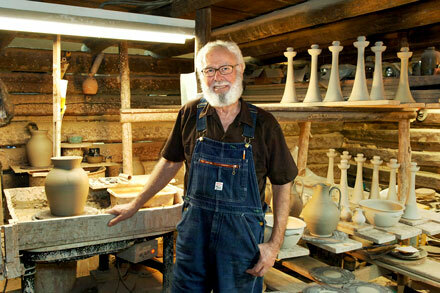 After retiring from a career building aircraft in 1978, Cleater returned to potting fulltime at his home in Byron, Georgia, where he used an old treadle kick wheel to turn clay he dug from land he owned in the mountains. In 1983 he built a wood-fired kiln on that land and may have fired the churn there, much as his forebears had done nearly a century earlier. Even before his work at the Smithsonian, Ralph Rinzler was an inveterate field worker who kept his eyes open for exemplary traditional artists wherever he traveled. His forays down South, especially, exposed him to many regional traditions and fine practitioners who were unknown outside their local communities. Bringing their voices and talents to the fore became his passion—and the mission of the Folklife Festival. 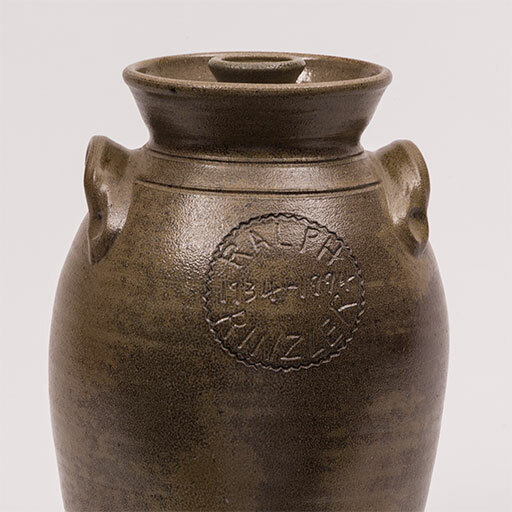 It is no accident that Southern potters are so well known today, along with the music of Dewey Balfa and Doc Watson; they were all people Rinzler brought to national attention at the Festival. This work has gone on now for fifty years with the artists front and center: telling their stories, exemplifying excellence in practice, and representing the remarkable diversity of traditional cultural heritage throughout the world. Cleater Meaders Jr. working in the Festival tent. With little information on record, we assumed this menacing mask hanging in the hallway came from the 1994 Thailand program. On further investigation, we learned otherwise. Because the Center is a research unit within the Smithsonian, not a museum, it never set out to build a collection from the Festival. But over the past fifty years, Festival artists and others have generously donated hundreds of objects to the office. Until recently, however, the knowledge of who made them or what program they were associated with rested largely within the memories of staff. A simple inventory was started in the mid-1980s, but record-keeping has lagged as the work of producing the Festival takes precedence. Throughout it all, the collection was carefully hung on the walls and enjoyed by all who visited the Center’s office. I have been affiliated with the Center as a research associate since 2014, working specifically on this unintended collection—updating the records, writing labels, and conducting research to prepare this exhibition. Selecting fifty objects to celebrate the Festival’s fiftieth anniversary has been a delightful challenge. The Thai mask down the hall was an obvious pick: it is large, fierce, and demanding—but no one knew anything about it. “Thailand” is written on the right side, and “Long Live the King” scrawls across the front. This made it easy to think it was from the 1994 Thailand program. 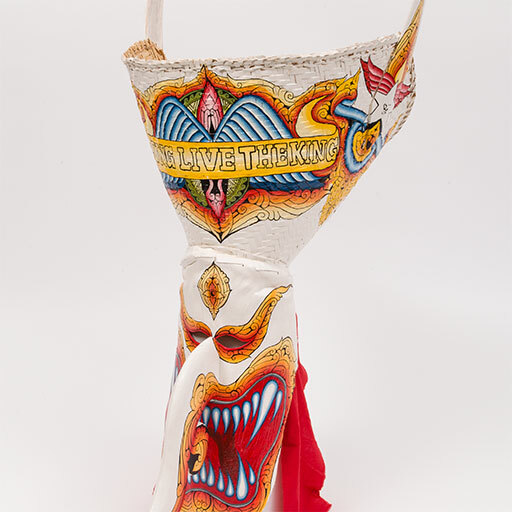 But after speaking with retired curator Richard Kennedy, it was clear that it wasn’t—that program focused on court music and dance, and this mask was not part of those traditions. The mask as it hangs in the office hallway. Wirayut Natsaengsri at the Festival. In summer 2016, intern Michelle Ibarra took on the quest to identify the mask. She eventually determined it was a “ghost mask” used in the Phi Ta Khon celebration in northern Thailand, and its maker, Wirayut Natsaengsri, participated in the 2007 Mekong River program. Her efforts are documented in the article “Searching for the Man behind the Mask.” Today Phi Ta Khon—in which ghosts rise up and parade through town before laying down again—is heavily promoted as a tourist attraction. But its origins are ancient and have ties to Buddhism and early agricultural rituals, which the practitioners still honor. 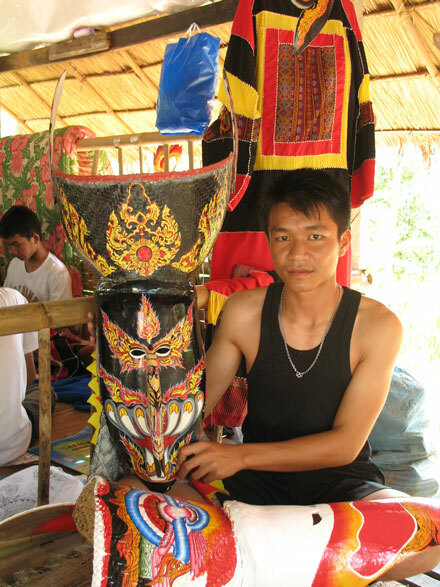 Young artisans work on Phi Ta Khon masks in Dansai, Thailand in 2006. Wirayut Natsaengsri with two of his masks in Dansai village, Thailand, in 2006. 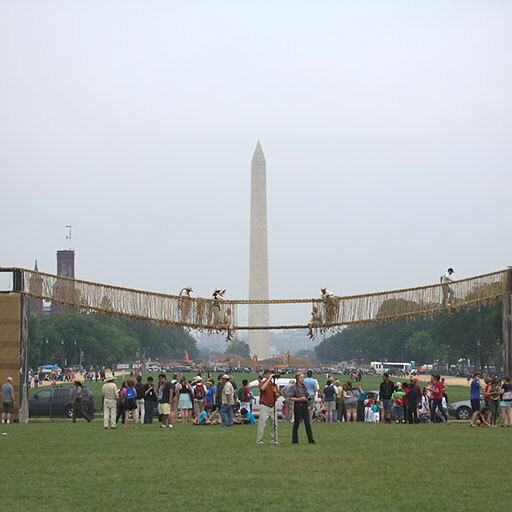 The Q’eswachaka rope bridge nears completion on the Mall. The Q’eswachaka rope bridge in the Cusco highlands of Peru—rebuilt hundreds of times over hundreds of years by the local communities—was reimagined and rebuilt on the National Mall in 2015. It became both the visual anchor and community center of Perú: Pachamama. Rope braiders Alejandrina de Mamani and Alejandrina Puma pound the gathered and dried grasses prior to twisting them into rope. The slow process of creating rope continues with the bridge builders. Ritual offerings are made throughout the bridge building process. The handwoven rope bridge has brought together the four indigenous farming communities in the area for centuries. Each has a specialty: the engineers come from one community; the grasses for the rope are gathered and processed by another. There is special expertise in braiding and tying the ropes, as well as stringing them across the canyon. At each stage, the spiritual leader makes offerings that include coca leaves, potatoes, and corn. When the bridge is finished, the community gives thanks, celebrates with music, special foods, and a corn beverage. These practices were observed on the Mall with only slight modification. 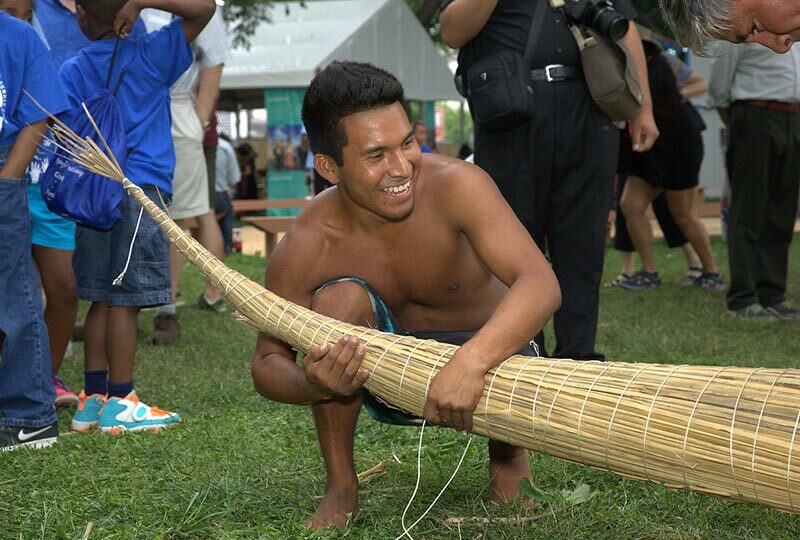 A unique, multi-cultural Peruvian community came together during the 2015 Festival. When the time came to hoist the heavy rope up from the ground, members of the Afro-Peruvian musical group Tutuma joined the Quechua bridge builders to add their muscle. The Quechua builders celebrate completion of the bridge, made in the tradition of the Q’eswachaka bridge in Peru. Once the ropes were finished, the bridge-building team carried them up the support structure. 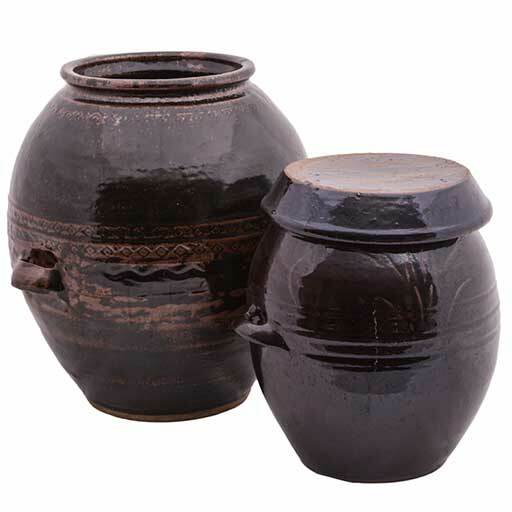 Made by itinerant potters on the fringes of Korean society, large earthenware storage jars—onggi—were “as common in Korea as refrigerators are in the United States.” So wrote Festival director Ralph Rinzler after a research trip to Korea in 1971. For centuries, onggi were essential to preparing and storing the core staples of the Korean diet: soy bean and red chili paste, spicy kimchi, and more. The low-fired earthenware had a distinctive porosity that allowed oxygen to enter without letting liquids evaporate, aiding the fermentation process required for these foods and condiments. With that trait, onggi persisted for decades after the introduction of commercial wares. The onggi making industry was little known and poorly documented outside of Korea until the 1970s. On his first trip to Korea in 1971, Folklife Festival director Ralph Rinzler was captivated by the large, lidded jars he saw clustered outside most village homes. He returned the next year to do more research, and again with anthropologist Robert Sayers in the 1980s. 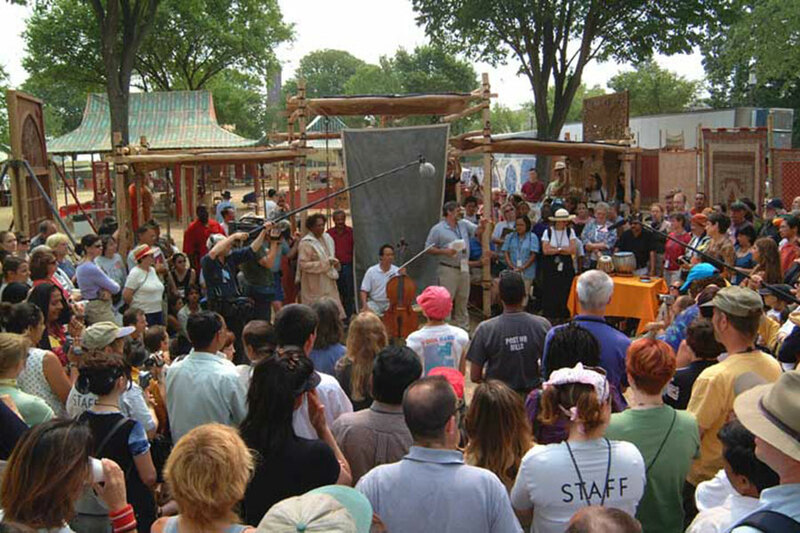 Such thorough fieldwork is a mainstay of the Folklife Festival, which featured onggi pottery in the 1982 Korea program. In the case of onggi pottery, there was much to learn. Rinzler and Sayers started with the lives of the artisans and were surprised to learn that the makers were near outcasts of Korean society. The potters were confined to company housing and frequently had to move as production demands shifted. Ten years after his first visit, Rinzler found that Korea was much changed and many of the rural pottery sites had disappeared or been consolidated. He also noted a serious shortage of apprentices to carry on the tradition. At the same time, collectors began purchasing the older vessels. Commercial food producers continued to use onggi to reinforce the authenticity of their product. Master artist Alfredo López of Ayacucho, Peru, takes us on a cultural journey through his storytelling shrine, acquainting us with a world of belief, the life of cattlemen, and the customs of communities in the Peruvian Andes. This large, colorful retablo is exemplary of Alfredo López’s finest work. It holds layers of meaning about his community’s heritage and the details he chooses to depict. He learned to make retablos from his father and grandfather, and today still uses his grandfather’s molds. During the tumultuous 1980s when the militant Marxist-Leninist “Shining Path” insurrection took over the highlands, many families fled the region. López’s family managed to stay, and his grandfather was pivotal in keeping the retablo tradition alive. 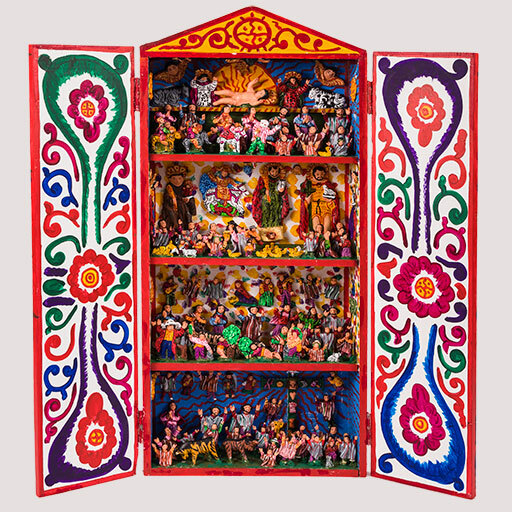 Retablos grew from early portable altars carried to South America by Spanish missionaries. Saint Mark—the patron saint of farm animals—became a favorite figure of cattle ranchers and was believed to protect the herds from disease and theft. Thus did the worlds of colonists, missionaries, and indigenous people begin to entwine. The inclusion of cattle with everyday life and religious practice still mark the retablos of Ayacucho—this box included. On the ground level, community members celebrate the Pukllay Fiesta with an Andean bullfight in the field, surrounded by prayers and blessings. The second level features the whipping of cattle thieves with community members pleading for pardon. One woman begins preparing a mesa, an offering of thanks to the sacred mountains, floating above them all. The third level shows the patron saints of animals favored in the region: goats, sheep, cattle, and packing animals. Additional offerings are made of birds and bound calves. People are on their knees praying to give thanks for a good year. The top level features an Andean celebration of the birth of Jesus. Traditional figures of the nativity are depicted , along with a güeros de Ayacucho (clown) with a white face mask, said to be able to disclose the secrets of others. 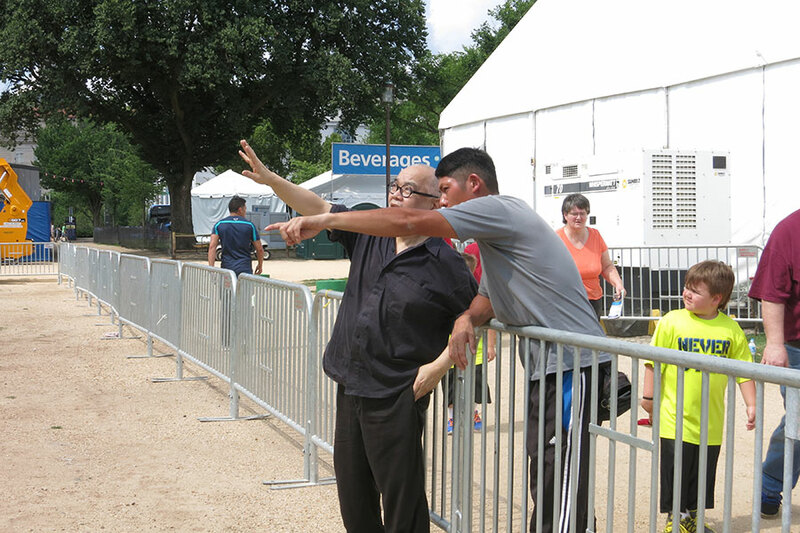 Alfredo López at the Festival Marketplace. 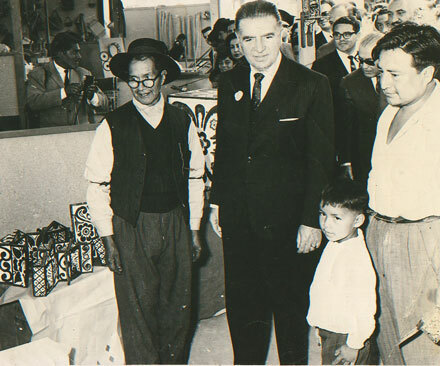 Young Alfredo with his father, standing next to former Peruvian president Fernando Belaunde Terry. Interview with Alfredo López, transcribed in Spanish. 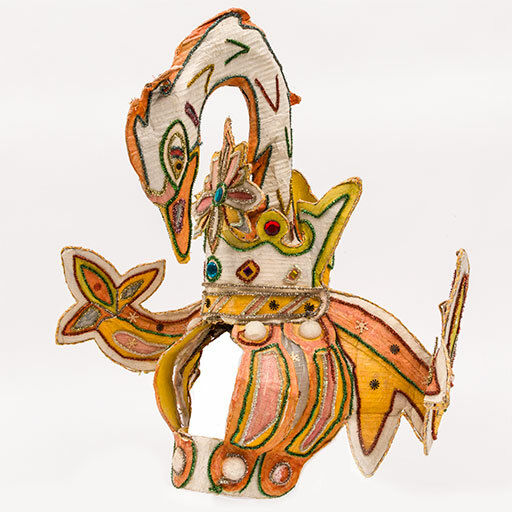 Made of corrugated cardboard and tissue paper, then decorated with paint, tinsel, and flashy jewels, this bird-shaped headdress was worn in The Commonwealth of the Bahamas “Junkanoo rush”—joining more than a hundred other costumed participants. Program curator John Franklin opened his Festival essay by challenging the touristic view of the Bahamas as a warm, sunny, winter getaway from the United States. His overview called up the four centuries of migration that have defined the Bahamas’ past and continue to shape its future. It’s a complex story of outsiders coming and going—Spanish, English, enslaved and freed Africans, American tourists, and more recently Chinese, Syrian, and Greek immigrants. Throughout it all have been the traditions of festival arts and performance, known to many outside the Caribbean as Carnival, and in the Bahamas as the Christmas masquerade of Junkanoo. The roots of these pubic celebrations of freedom are tied to West Africa and have been transformed by generations of Afro Bahamians dreaming of and finally experiencing liberation from slavery. Junkanoo parade at the Festival, including a Fourth of July float. Today’s elaborate masquerades combine music, dance, costume, and drama in stunning performances that sustain their participants throughout the year. In the Bahamas, Junkanoo is celebrated in parades that begin in the early mornings on December 26 and January 1 and last for hours. People prepare nearly all year for these judged, thematic performances. During the parades, men and women of all backgrounds coexist in a kind of “time out of time” where satire, protest, and affirmation are safely expressed and acted out. “It’s a leveler,” curator Diana N’Diaye says. “You may be dancing next to the next prime minister who might be dancing next to a janitor. It’s like, ‘We’re all Bahamian; we’re all here.’” It’s a creative way for individuals to express shared values related to freedom, heritage, and different forms of expressive culture. The 1994 Bahamas program included more than a hundred participants from seventeen Junkanoo groups. As in the Bahamas, they staged a “rush out” at the end of the Festival and everyone joined in. While thousands may join the parade in the Bahamas, hundreds did on the National Mall—giving Festival visitors a small taste of the transporting experience of Junkanoo. The idea for Oman: Desert, Oasis and Sea grew out of what curator Richard Kennedy described as the progressive “disintegration of understanding of Muslim culture” after the events of September 11, 2001. The incoming American ambassador to Oman had seen the Festival’s Tibet program in 2000 and asked Kennedy if the Center for Folklife and Cultural Heritage might feature a Muslim country. Kennedy brought the idea forward, and the Oman program was born. In Kennedy’s memory, it was a dream program with creative collaborators, strong in-country support, and a positive experience on the National Mall. 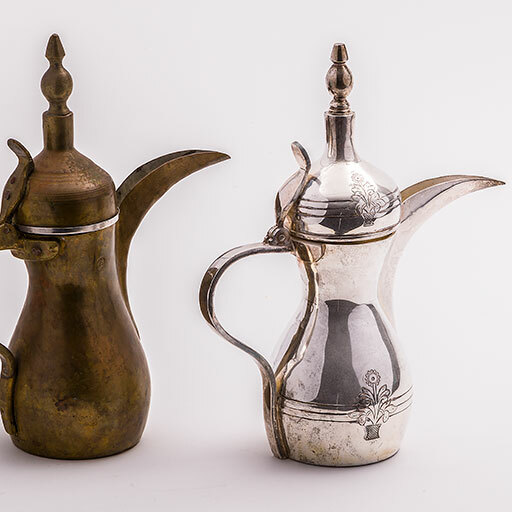 The two hand-formed dallah—coffee pots—highlighted here were presented to the Center as gifts from the Sultanate of Oman. For those who might imagine a dark Starbucks brew being being poured from the spouts, visitors to the Folklife Festival found that Omani coffee is very different. Green coffee beans are lightly roasted in a pan over an open fire and ground into a fine powder with a mortar and pestle. The coffee powder is then mixed with boiling water in the dallah, along with cardamom, rosewater, and saffron. The host then uses the dallahto pour the brewed coffee into small cups called finjan. The resulting beverage is tea-colored and served to guests along with dates and other sweets. No polite guest declines coffee when offered. Coffee is poured by a shop owner in Oman. Dates and coffee are served at the Festival, illustrating Omani hospitality. Beyond their function, these pots also represent the rich heritage of Omani metalwork. Crafts have long played an important role in Oman’s economy, and the souks (marketplaces) of the oasis towns house permanent workshops where artisans practice and sell their wares. There is a rich interplay between these production centers and the port capitals that have long functioned as gateways for new ideas, materials, and peoples throughout the region. The resulting craft culture in Oman is a lively synthesis of tradition and change, with discernible Arab, Indian, and East African influences. For the Center, these pots embody the value of direct cultural exchange that created a spirit of friendship, welcome, and collaboration. The painter of this Tibetan scroll is unknown to us, but the purpose was clear. It was made as a gift. The iconography is unique to the occasion: the 2000 Smithsonian Folklife Festival program on Tibetan culture. One of the most beautiful objects gifted to the Center for Folklife and Cultural Heritage is this Tibetan thangka—a contemporary religious scroll created in support of the 2000 Tibetan Culture Beyond the Land of Snows program. 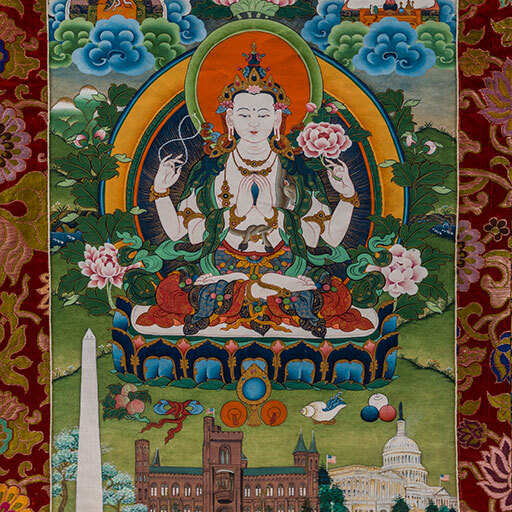 It is one of ten commemorative thangkas commissioned for major donors by the Conservancy for Tibetan Art and Culture, a local collaborator in Washington, D.C. The program title refers to people who are Tibetan but now living outside the historical and ethnographic boundaries of Tibet. The thangka’s iconography is distinctively blended, not unlike the Festival itself. It features the central figure of Chenrezig—the embodiment of the compassion of Buddha—surrounded by multiple recognizable symbols relating to his core attributes of kindness, compassion, joy, and equanimity. Below the lotus platform are more symbols of Buddhism, and below those, clear renderings of D.C. landmarks: the Washington Monument, the Smithsonian Castle, and the Supreme Court. This detail shows the Smithsonian Castle, Supreme Court, and U.S. Capitol at the thangka’s lower edge. While the thangka was created before the Festival by an artist who did not participate in the program, the work can be read as a foreshadowing of the event in which Tibetans from all over the world—including His Holiness the Dalai Lama—gathered to speak of their heritage, identity, and experiences “beyond the land of snows,” memorably capturing the setting and transformative potential of the upcoming program. 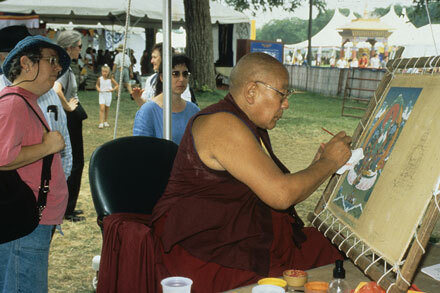 A Tibetan monk demonstrates thangka painting at the 2000 Festival. Overall: 48” L x 29” W; painting: 24.5” L x 15.5” W.
During the 2002 Silk Road program, the Mall became a modern version of the ancient Eurasian trading route. Visitors could stroll from the towering Nara Gate at the eastern edge toward an open Venetian Piazza to the west. 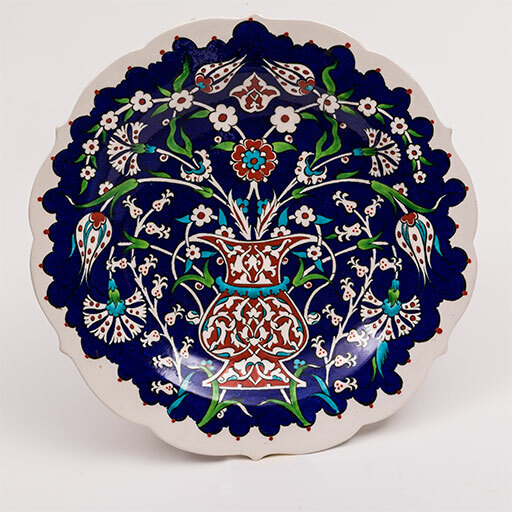 Beautiful Turkish çini plates helped lure visitors into the Ceramics Courtyard. Silk Road was the perfect Festival to follow the events of September 11, 2001. 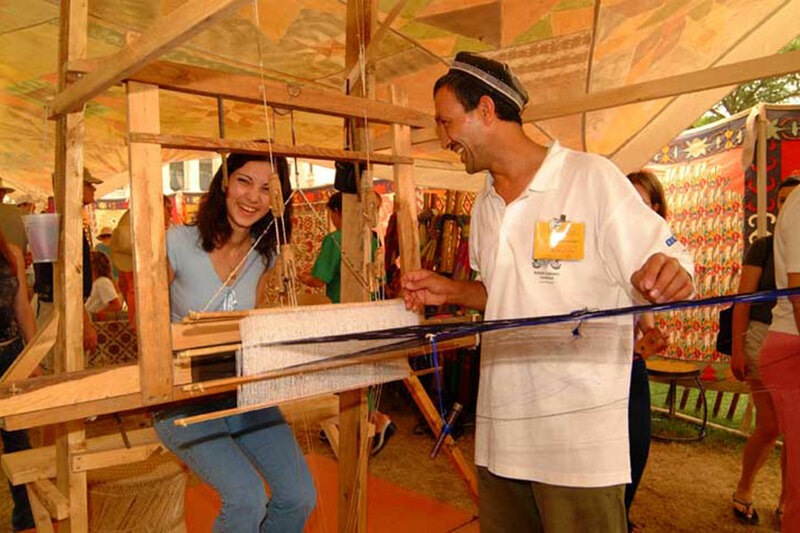 Although planning had begun several years earlier, the program’s theme of “Connecting Cultures, Creating Trust” tied past and present together. Yo-Yo Ma, the visionary cellist and artistic director of the Silk Road Project, Inc., was a presenting partner. Through his own travels and work in different musical styles, he was captivated by the legendary trade route and how music traveled and changed along it. To talk to anyone who attended the 2002 Festival is to hear a long string of superlatives. Richard Kurin, Center director at the time, reported that “more than 400 artists, cooks, musicians, and scholars—Muslims, Christians, Hindus, Buddhists, Jews, Sikhs—from more than two dozen nations, speaking more than thirty languages” traveled to Washington that year. Program curator Richard Kennedy recalled, “Never before has a Festival been devoted to one topic; never before has a Festival offered such research, conceptual, and logistical challenges… It has been a daunting but exhilarating effort.” Over one million people attended. Looking east towards the Nara Gate (and Washington Monument). Central Asian Textiles in Carpets area. Silk ikat weaver from Uzbekistan working on a hand loom. Hasan al Kazzan’s family has been in the glass-blowing trade in Syria for 400 years. Final words are delivered by site designer Rajeev Sethi (standing center left), Silk Road Project director Yo-Yo Ma (seated with cello), and Richard Kurin, Center for Folklife and Cultural Heritage director (speaking). The Silk Road program remains a singular event in the Festival’s history. 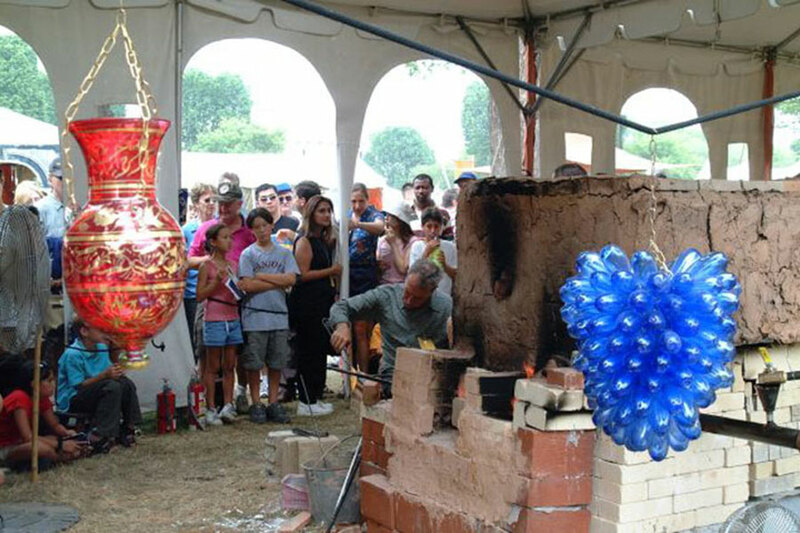 Mehmet Gürsoy was one of two Turkish ceramicists at the Festival. His studio is located in Kütahya, where he is known as a teacher and entrepreneur. An online exhibition about his work is included below. 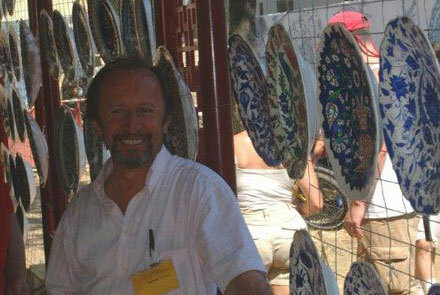 Mehmet Gürsoy stands in front of a display of çini plates in the Ceramics Courtyard. Ethel Wright Mohamed of Belzoni, Mississippi, became a favorite Festival participant during the 1974 Mississippi program. Ten years earlier, she had turned to embroidery to commemorate life with her husband who had recently died, carrying on an age-old domestic art form in a distinctively personal way. Working with the Folklife Festival designer to plot the layout of the 1976 Bicentennial program, Ethel Mohamed sketched and then stitched a remarkable prediction of the great American celebration set to unfold on the National Mall. The Festival spanned three months and included a large roster of participants who cycled in and out of Washington every week for twelve weeks. In addition to the core Festival areas, Mohamed stitched lively tableaus throughout: children playing, a couple kissing, a rabbit sneaking lettuces. The final embroidery is five feet long and hews to the plan so well its program elements can still be easily deciphered. Smithsonian Secretary S. Dillon Ripley feeds ducks at the Reflecting Pond. Ralph Rinzler plays on the Main Stage second from left. Ethel Mohamed works on an embroidery in her tent. As a creative endeavor, Mohamed’s memory picture is a beloved object at the Center for Folklife and Cultural Heritage and new details are noticed on almost every viewing. Two figures central to the Festival’s history are included: Smithsonian Secretary S. Dillon Ripley—who enthusiastically supported founding director Ralph Rinzler’s plans to create an event to give voice to the country’s traditional artists—kneels in the upper right corner to feed some hungry ducks. It is a clever nod to his academic field of ornithology. Down front and center, Rinzler plays a fiddle on the mainstage, identified by an “R” on his right sleeve. Mohamed herself sits under a tent, stitching yet another memory picture. 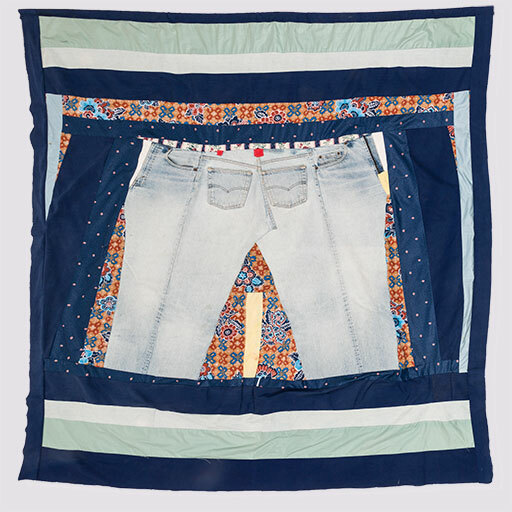 This engaging piece is a tour de force of narrative embroidery that not only reflects Mohamed’s special talents but conveys her love of the Festival community that embraced her so warmly each time she came to Washington. Ethel Mohamed at the 1974 Mississippi program. Recognize this form? It’s an apex stone—the decorative block mounted to the top of a church as the base for a cross. It’s so perfectly carved people often ask if it is cast. 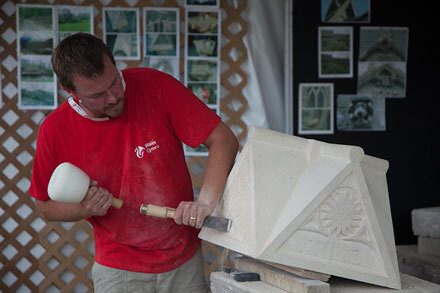 Master stonemason Selwyn Jones, an expert in restoring Welsh architecture, carved this apex stone during the 2009 Festival. By all accounts, he was a highly skilled participant and a captivating presenter. His tent was always filled with people watching him work, asking questions, and trying their hand at chiseling and carving the stone. Selwyn Jones’s tent was a busy place where he explained what he was doing and encouraged people, especially young ones, to help him. 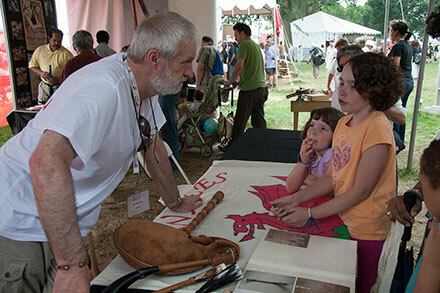 The Wales Smithsonian Cymru program was built around the theme of sustainability. Centuries of tradition, change, and innovation have resulted in Wales’s current reputation as a world leader in sustainable practices. Few things in architectural practice are more sustainable than historic preservation—an endeavor that maximizes the use of existing materials, reduces waste, and helps preserve the identity-giving character of a community and its institutions. 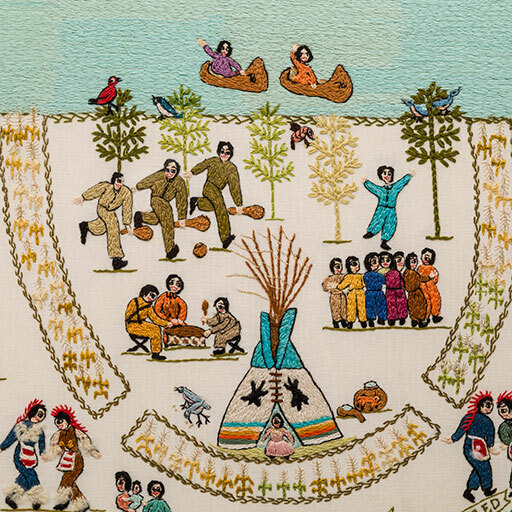 As curator Betty Belanus wrote in the program book, “sustainability is built upon the rediscovery and reinterpretation of older practices.” Understanding those traditions instills pride in the past and can hold solutions to challenges communities face today. 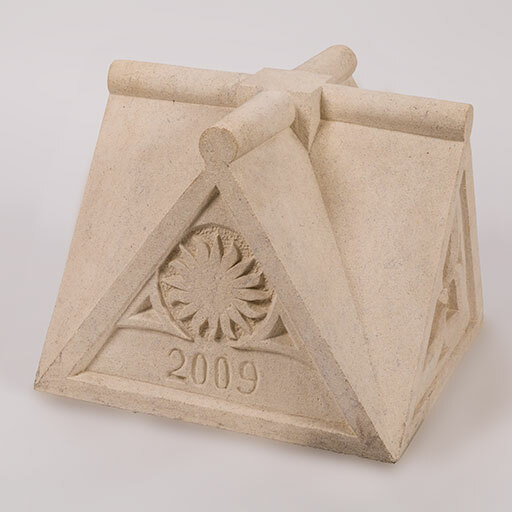 With nearly thirty years of experience, Selwyn Jones is adept in many areas of stonework. He first trained as a metal sculptor, then apprenticed with a stonemason. In his own words, he is “passionate about traditional skills” and openly shares his enthusiasm with others. Restoring historic buildings gives them new life, and being part of that process connects Jones directly to the roots of his heritage. 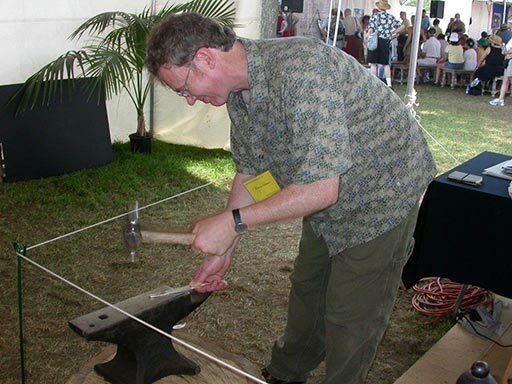 Jones reviews the tools he uses and the apex stone he is carving during the 2009 Wales program. “Anything to do with stone, we can restore it,” Jones explained at the Festival. This can include taking a building completely down and rebuilding it, replacing a few stones, or—as in the case of an apex stone—replicating the shape and design of that distinctive church feature. The four-pointed apex is made of English limestone, a building material known for its tight, smooth grain that “holds the cut well.” The layout allowed him to work on all sides of the stone. 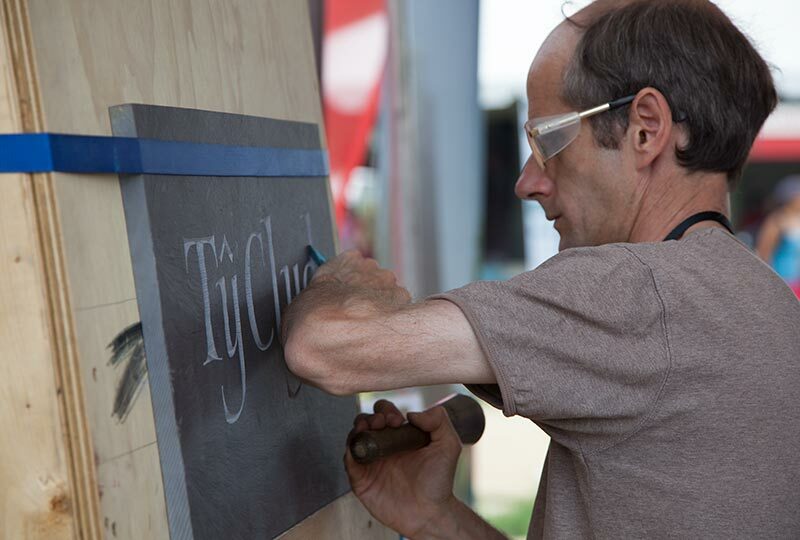 He encouraged both men and women to help chip out stone, noting: “You don’t need physical strength, but you do need patience!” Many who tried their hand at carving stone at the Festival would agree! Selwyn Jones at the 2009 Festival. Among the most important projects undertaken by Festival director Ralph Rinzler was the support and revival of Southern crafts in collaboration with Nancy Sweezy. Jugtown Pottery in North Carolina was central to the story. Decades after first meeting Rinzler, Jugtown potter Vernon Owens crafted this memorial churn to honor his friend. When Ralph Rinzler came to the Smithsonian from the Newport Folk Festival in 1967, he brought with him an expanding concept of a “folklife” festival. 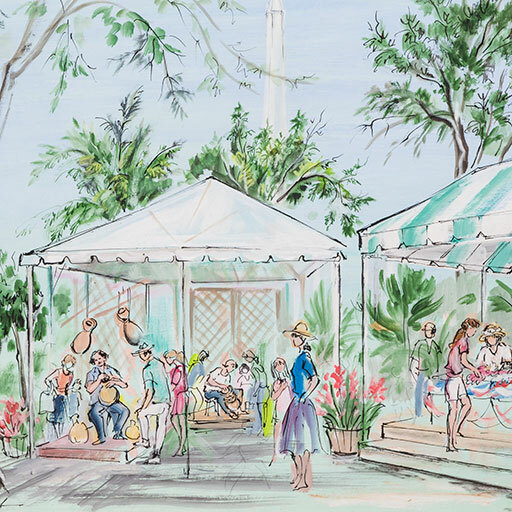 He had begun inviting craftspeople and artisans to Newport and saw “folklife” as all facets of a community’s culture, music, worship, handicrafts, food, and work traditions. In tandem with folklorist and potter Nancy Sweezy, they formed Country Roads, an organization dedicated to conserving Southern crafts. One of the workshops they supported was North Carolina’s Jugtown Pottery, established in 1921. Sweezy had moved south to work at Jugtown in the late 1960s and through Country Roads helped revive interest in the many potters living in the Carolina region. Country Roads purchased Jugtown in 1968, and Sweezy later authored the landmark book, Raised in Clay. Ralph Rinzler speaks with a potter at Jugtown in 1966. Vernon Owens grew up North Carolina and learned pottery from his father, who learned from his. His grandfather, in fact, was one of the first potters hired at Jugtown in 1921. 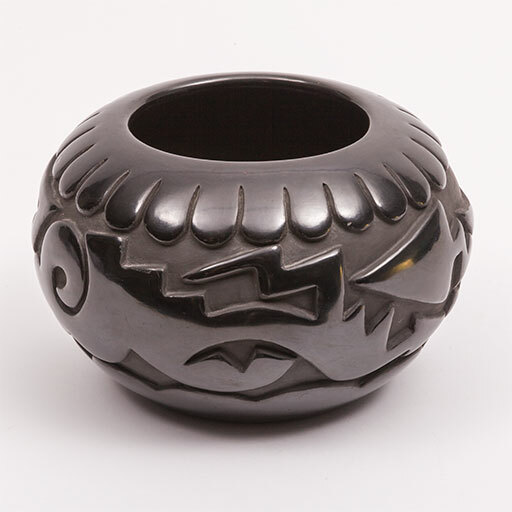 In 1960, Owens hired Sweezy and later worked closely together to develop new and safer glazes, improved firing techniques, and refined market strategies for their distinctive, functional pieces. Owens bought back Jugtown from Country Roads in 1983 and opened the Jugtown Museum in 1988. There are now more than seventy potteries in the Seagrove, North Carolina area. Vernon is widely recognized for his mastery, and he was awarded a National Heritage Fellowship in 1996. After Rinzler passed away in 1994, there was a memorial gathering at the Highlander Center in New Market, Tennessee. Many of his friends from his life in folklore attended. Owens was one of many whose life had been affected by Rinzler’s work, and he crafted a special memorial churn in his honor. 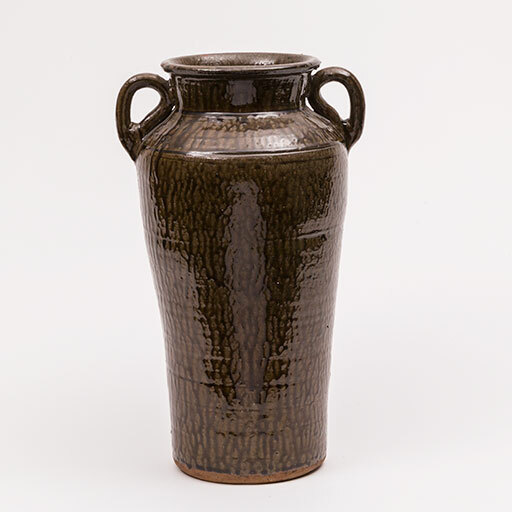 It was later donated by Rinzler’s wife to the Center for Folklife and Cultural Heritage, where it sits proudly in the entry display case among a collection of Southern pots. 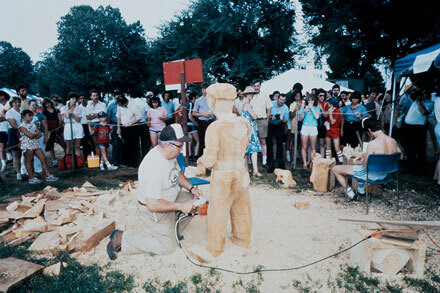 Using a chainsaw and file, Rodney Richard Sr. carved a nearly life-size French-Canadian woodsman named Pierre on the National Mall in 1983. Twenty years later, he came back and carved a dog to keep the woodsman company. Together they greet visitors to the front lobby of the Center for Folklife and Cultural Heritage. Rodney Richard Sr. (1929-2015) represented the logging heritage of western Maine at three different Folklife Festivals. His father William and son Rodney “Butch” joined him at different times, highlighting the multigenerational skills of the Richard family—born in the woods and carried on in public view. For Richard, his talent with a whittling knife began as a “little shaver” when he learned to carve from his father. In time, he began using his chainsaw to create larger figures. 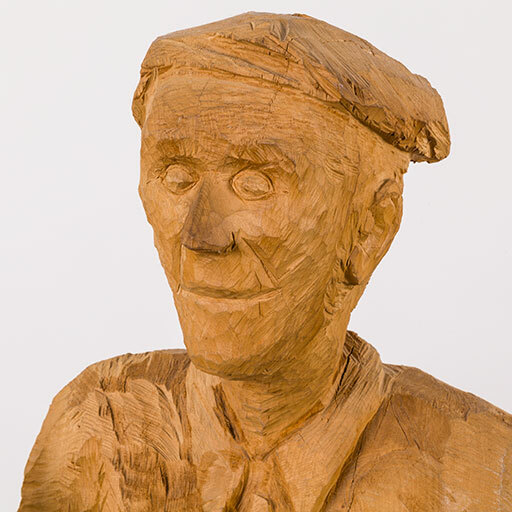 He was fond of saying, “The chainsaw is just like a jack knife, only a really powerful one!” He eventually became a well-known carver and is part of the legacy of “logger art” that developed around the North American forest industry. Rodney Richard Sr. talks about learning carving in an interview recorded during the 2005 Forest Service program. In addition to carving bears and other animals, Richard took care to depict the occupational skills that were so important to the world of work he knew, in part because he saw the old-time knowledge slipping away as new machines and methods replaced the old. Pierre, for instance, rests against a peavey hook, a hand tool used to maneuver felled trees. His sleeves are rolled up, ready to execute his next move. In 2005, Richard returned to the Festival to participate in the Forest Service program, where he carved a small dog to keep Pierre company. Richard uses his chain saw to carve the dog that later joined “Pierre the Woodsman” in the Center’s lobby. Fondly known as the “Mad Whittler” in Rangeley, Maine, Richard co-founded the Rangeley Lakes Region Logging Museum (now the Maine Forestry Museum) in 1979. In 1981, the museum hosted its first Logging Festival, an event that has been going strong ever since. Among the skills the museum highlights are chainsaw carving and whittling. 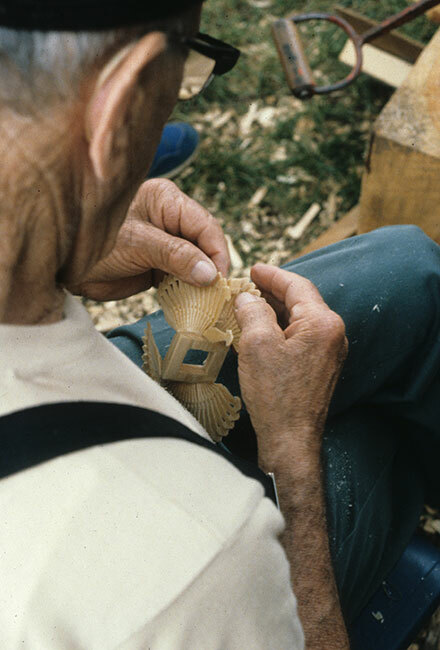 Rodney Richard Sr. works on “Pierre” at the 1983 Folklife Festival. 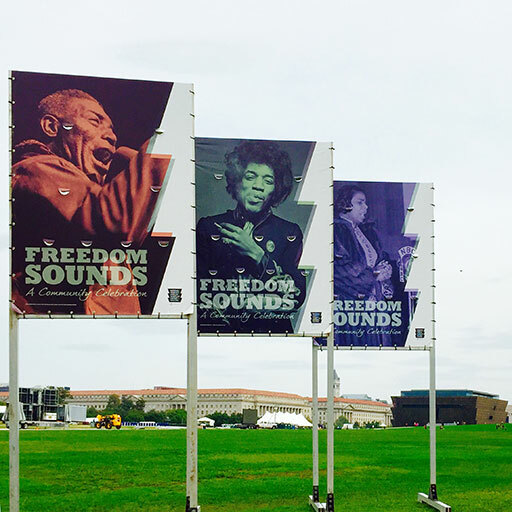 No sooner had staff, volunteers, and interns put the 2016 Folklife Festival to bed than we turned our attention to producing Freedom Sounds: A Community Celebration to welcome the new National Museum of African American History and Culture. Tens of thousands from every corner of the United States and beyond encountered the steady backbeat of music over three days filled with reflection and celebration. On the morning of Saturday, September 25, 2016, amid the peel of ringing bells and thunderous applause, the National Museum of African American History and Culture (NMAAHC) opened its doors to the public. While the broadcast media focused on the presidents, civic leaders, and entertainment giants who gathered on the museum grounds, another story—stories to be exact—was unfolding across the street. Tens of thousands made their way through closed streets and security checks to witness the museum’s opening and participate in Freedom Sounds. 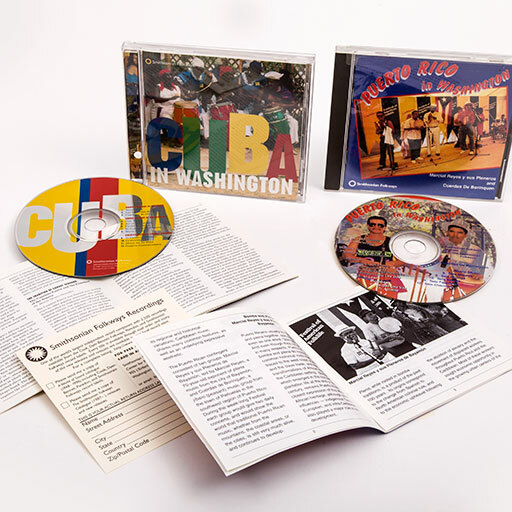 Co-produced by the Smithsonian Folklife Festival and the museum, the three-day event drew upon the social power of music to explore an enduring paradox: this nation was built on the ideals of freedom and equity, yet for generations it denied African Americans inalienable rights to life, liberty, and the pursuit of happiness. Through story and song, Freedom Sounds responded by paying homage to the resistance and creativity of a people as well as those who stood in solidarity with them. The museum’s founding director, Lonnie G. Bunch III, frequently reminds visitors that NMAAHC is a place of joy as well as a site for reflecting upon this country’s painful past. Its exhibitions and programs bear witness to the many ways that African Americans stood with strength, integrity, and yes, joy, even as others tried to bend and break their bodies and spirits. Visitors to Freedom Sounds found this sentiment woven throughout the opening weekend as they listened to diverse sounds of resilience from each of the festival’s five stages. From students and emerging artists to master musicians and superstars, performers shared music of sustenance and inspiration. An evening concert stretched across the Mall. The graphics used on the site and for staff t-shirts, designed by Josue Castilleja, represent the commitment of staff, volunteers, and interns past and present to demand the best of ourselves as we join others in building a just and creative world. Like our colleagues across the Smithsonian, we hope that our efforts contribute toward healing still present wounds and bringing change where it is still so desperately needed. 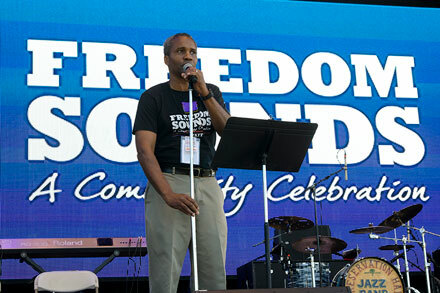 Program co-curator Mark Puryear announces the next act on the Freedom Sounds Stage. This Chinelo costume, replete with velvet, lace, and vibrant trim, includes detailed beadwork of legendary figures that inspired the maker: Egyptian goddess Isis adorns the front; a female Aztec warrior kneels on the back. 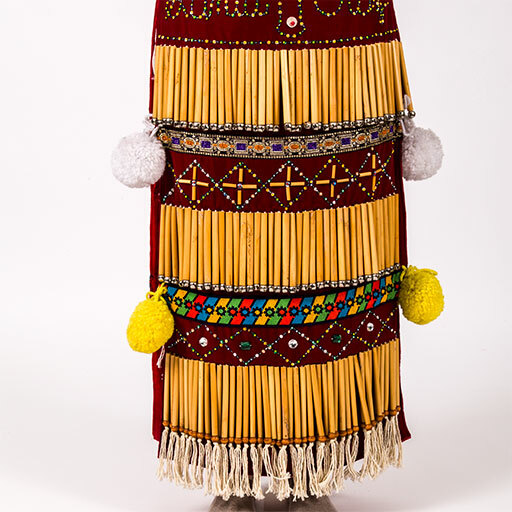 The costume was worn by dancer Karem Rodríguez Pacheco of Atlatlahucan, Mexico. Karem wears the Chinelo costume donated to the Center for Folklife and Cultural Heritage during this procession on the National Mall. 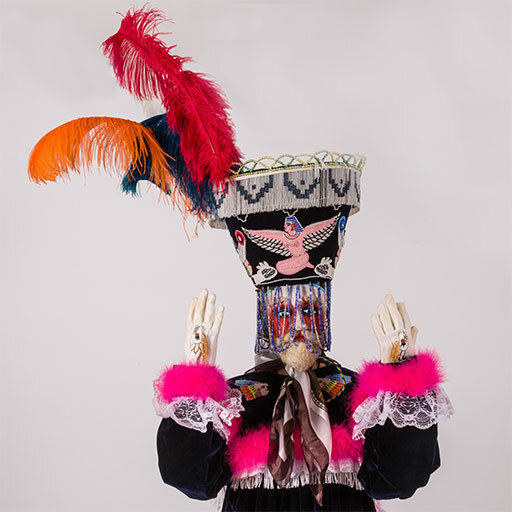 The Chinelos de Atlatlahucan are a carnivalesque dance troupe that form part of Mexico’s broad repertoire of dramas and masquerades drawing from European and Indigenous traditions. Dressed in elaborate velvet gowns and headdresses from head to toe, masked Chinelos playfully mock the white Spanish colonizers of the sixteenth and seventeenth centuries. During Carnival and community fiestas, they joyfully dance through the town accompanied by the local Banda de Morelos. Watch the Chinelos de Atlatlahuacan perform during the 2010 México program. The word Chinelo derives from the Náhuatl word tzineloa, which means “hip shake,” a movement intended to make the Chinelo look awkward or disjointed, adding to the ridicule. El brincón, or jump, is a traditional and lively dance, accompanied by a brass band, seen especially during Carnival festivities. Chinelo costumes are passed on over the years and redesigned over time. This costume was once decorated with a yellow boa. It was last redesigned was by Sergio Aurelio Rodríguez and Margarita Rebecca Pacheco, then worn by their daughter Karem Rodríguez Pacheco during the 2010 Festival. The scarf is used with the mask and headdress to protect the forehead and face from being rubbed by the mesh. Beads hang over the face, and a fully beaded and painted back panel is worn like a cape. Chinelos have become part of the identity of the state of Morelos in Mexico, and Chinelo dancers now perform the dances at various festivals in the United States. Tian Tian Xiang Shan Gateway on the National Mall. In the foreground, kite maker Zhang Wenzhi sends one of his creations up into the air. 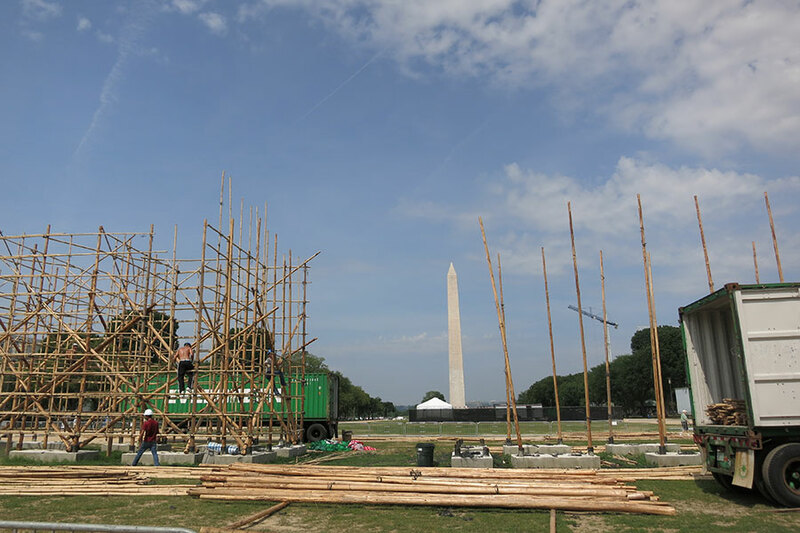 In Hong Kong, 1,000 bamboo poles and 200 wooden columns were loaded onto a ship bound for Washington, D.C. Six weeks later on the National Mall, five craftsmen lashed these together with nylon ties, forming a giant gateway. At three stories tall and 112 feet long, it was one of the largest structures ever built for the Festival. The Tian Tian Xiang Shang Gateway was a flower plaque, a traditional Chinese bamboo structure built for festive and memorial events, such as weddings, anniversaries, and business openings. Lightweight and modular, flower plaques are ephemeral and their materials reusable. Large-scale examples are most common in southern China, especially in Hong Kong. 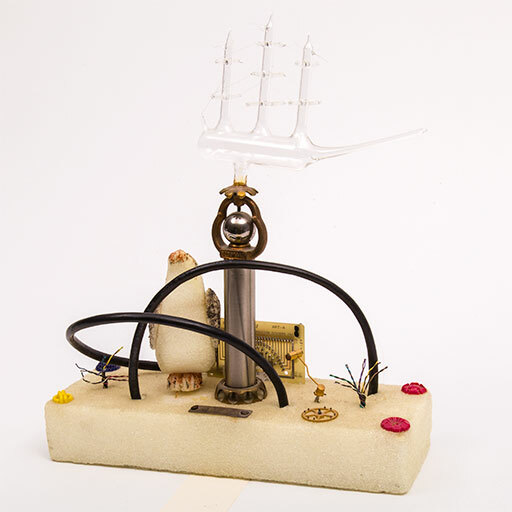 This installation embodied the intersection of traditional and contemporary arts, vernacular knowledge and scientific engineering. Hong Kong-based artist Danny Yung and his studio Zuni Icosahedron produced the structure in collaboration with master builder Choi Wing Kei. Yung is a pioneering artist known for experimental work in visual and performing arts. His flower plaque design included traditional motifs and elements, such as the names of all 100+ program participants, along with congratulatory text and greetings. 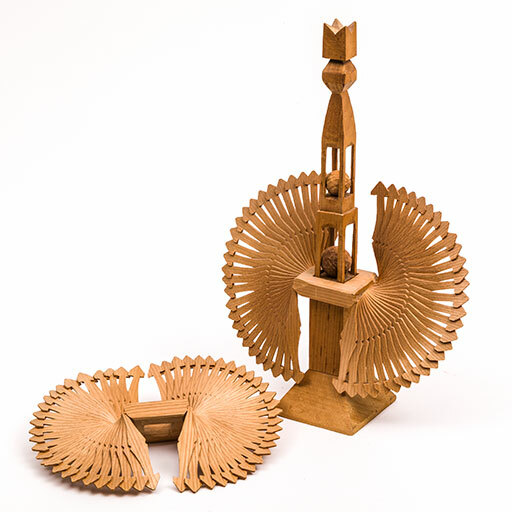 As a creative mash-up, the installation reinterpreted a phrase associated with Mao Zedong, invited contributions from 32 other artists, and incorporated 1,400 bamboo wind chimes, creating a sound dimension innovative for flower plaques. Master builder Choi Wing Kei, seated with with his team (L to R) Sit Kar Lok, Kan Chung Chi, and Chau Kai Ho. Kan Chung Chi (foreground) and Chau Kai Ho use long, thin strips of bamboo to attach a banner to one of the decorative panels. The structure in progress on the third day of installation, June 20, 2014. Kan Chung Chi directs the placement of poles from the ground. Sit Kar Lok starts lashes together the poles of a new level on the third day of installation. 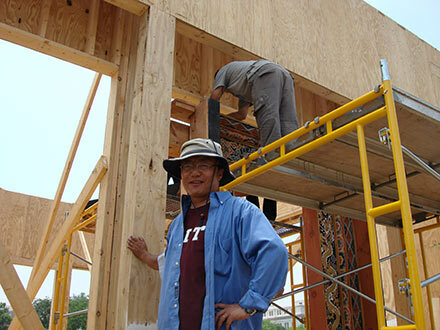 (L to R) Nai Tsun Lam, Sit Kar Lok, and Kan Chung Chi survey the progress on another part of the structure on the third day of installation. Choi Wing Kei secures a tie at the base of the structure on the third day of installation. 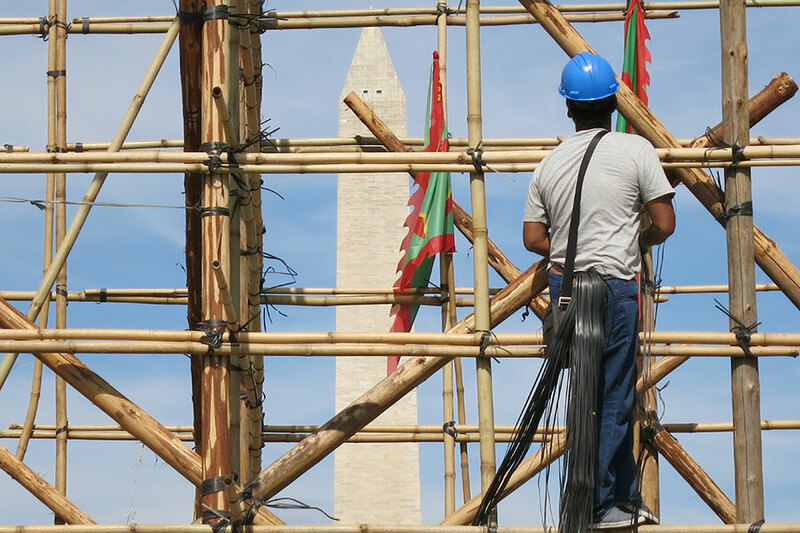 Sit Kar Lok, the most experienced craftsman on the team, takes a break while taking in the view of the Washington Monument during the third day of installation. Suspended from his waist are the nylon ties, pre-cut in 7’ lengths, that are used to lash the poles together. Artist Danny Yung (left) and master craftsman Choi Wing Kei survey the structure in progress on the fifth day of installation, June 22, 2014. The flower plaque team performs a dedication ritual for the structure on the Festival’s opening day, June 25, 2014. 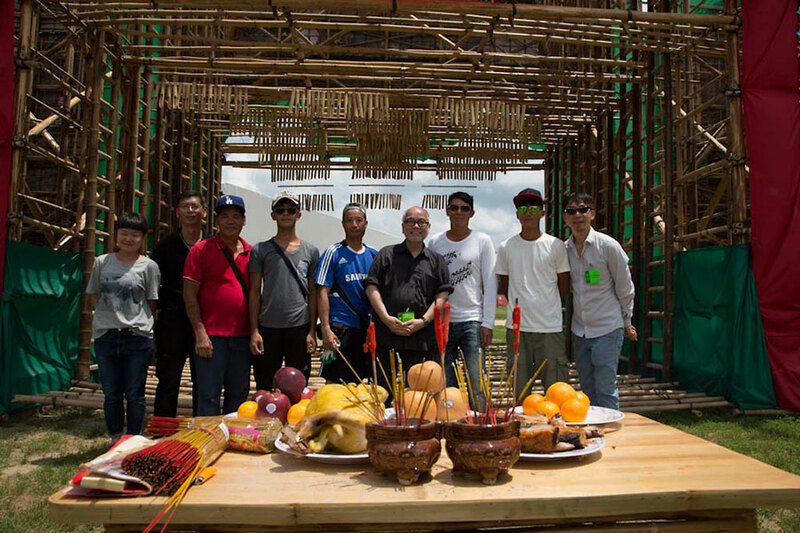 L to R: Liu Si (designer and coordinator), Wang Fai Soon (architectural consultant) Sit Kar Lok (craftsman), Chau Kai Ho (craftsman), Nai Tsun Lam (craftsman), Danny Yung (artist, director), Choi Wing Kei (master craftsman), Kan Chung Chi (craftsman), Wong Yue Wai (producer). 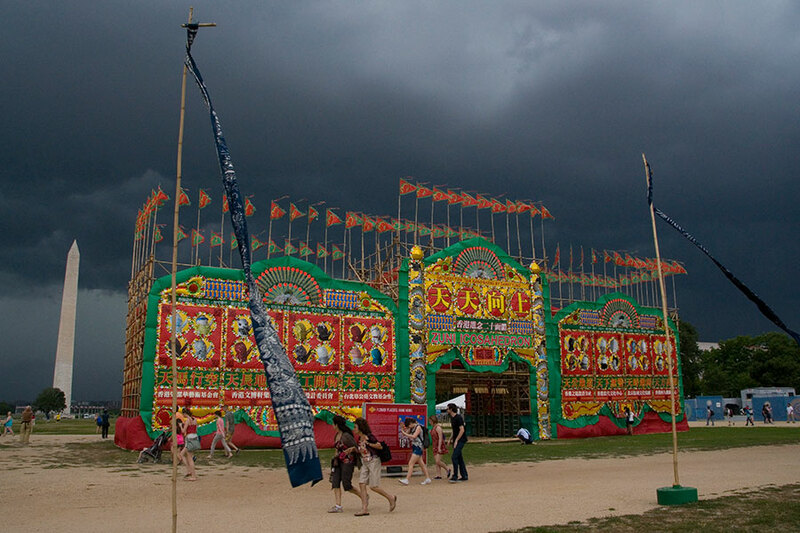 The Tian Tian Xiang Shan Gateway on the National Mall as a storm blows in. Visible in the foreground are batik banners made by another China program participant, Yang Wenbin of Guizhou. The flower plaque is taken apart after the Festival and will be repacked to ship back to China. 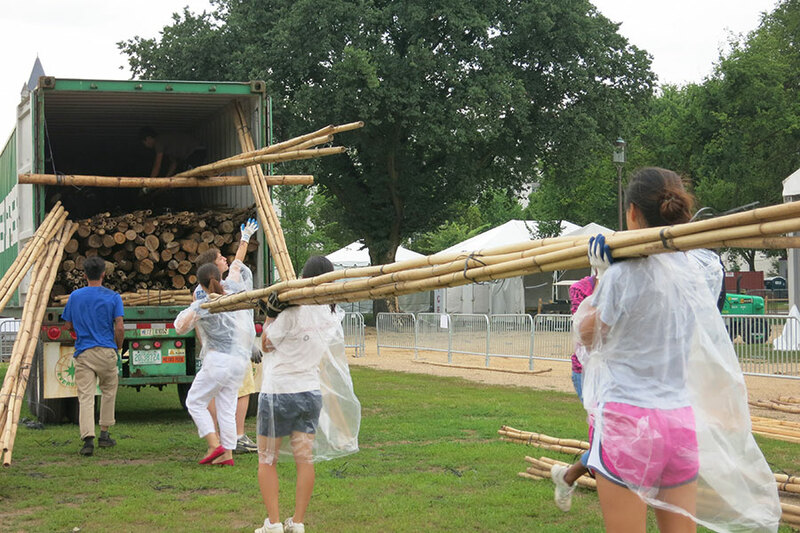 On a rainy day, China program team members Jing Li, Joan Hua, and Danielle Wu assist in loading the materials into a shipping container. 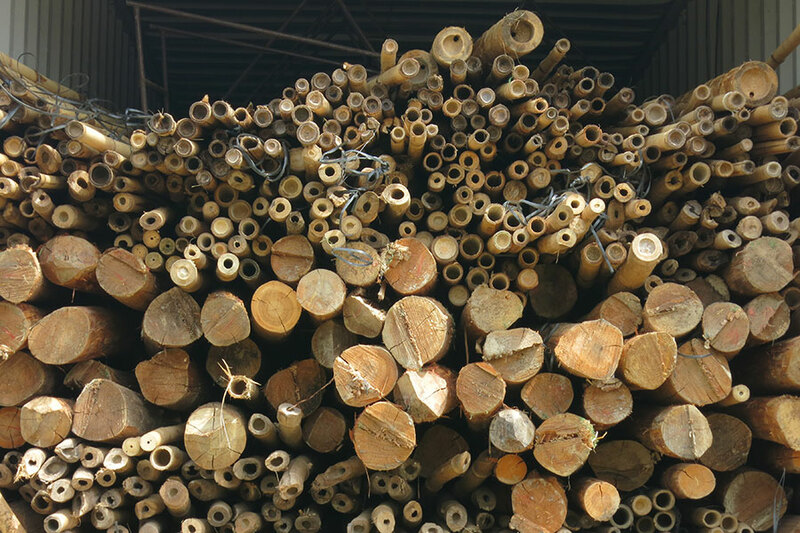 Bamboo and lumber are loaded into a sea container for their return to Hong Kong. The U.S. Department of Agriculture required that the materials be fumigated before arrival and that every bit leave the Mall and the country after its installation. 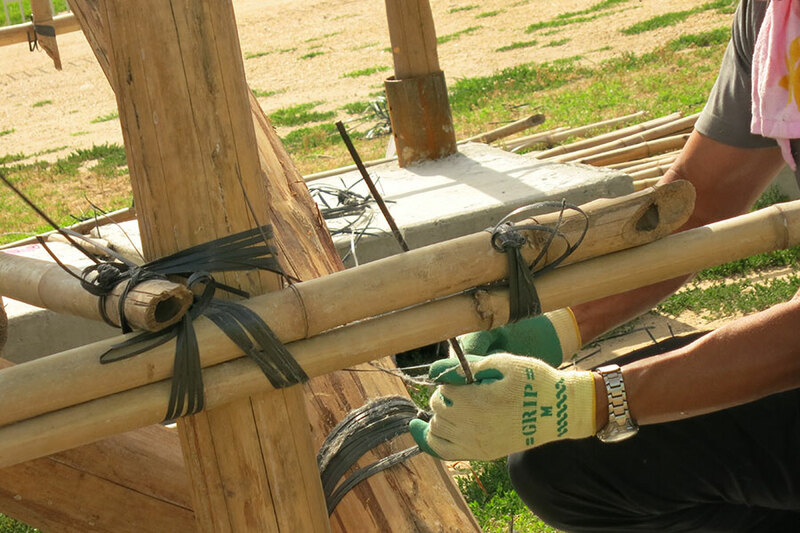 Choi began learning bamboo construction from his father when he was thirteen years old. 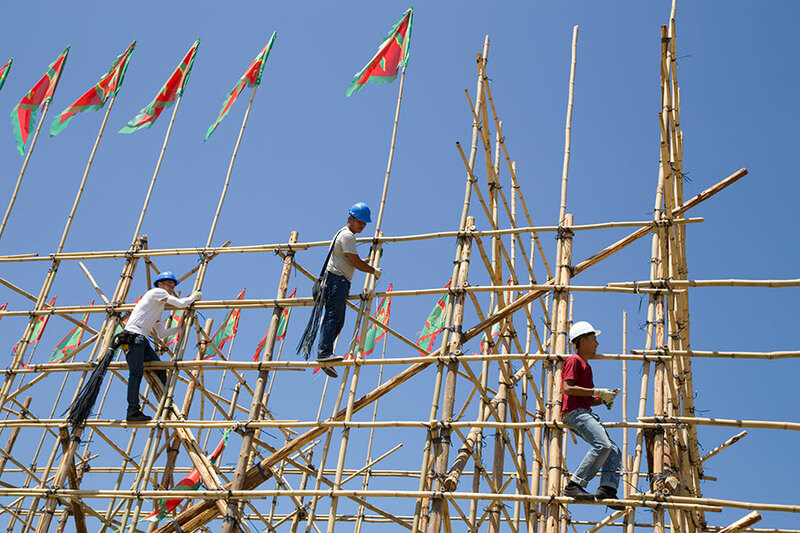 His business is one of a handful in Hong Kong with the skills to work in all aspects of bamboo structure building, including scaffolding, ritual structures, and temporary theaters. He welcomed the opportunity to try something new for the Festival, collaborate with a contemporary artist, and build outside of Hong Kong under different construction requirements. Preparing for the installation, Yung and Choi consulted with our production staff as well as Smithsonian engineers and fire safety officers, making changes to the structure, design, and materials as needed. A week before opening day, Choi and his team of four unloaded ten tons of bamboo and lumber from shipping containers. With no rigging or electric tools, they built the structure length by length, expertly lashing together the poles with nylon ties, extending it vertically as they climbed. After the Festival, in the same way, but in reverse, they took it down, repacking the materials for return to Hong Kong and use in their next project. 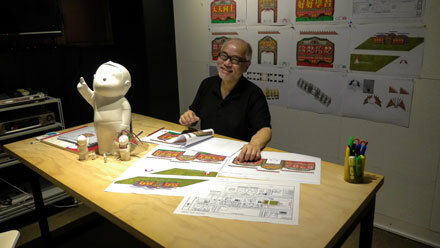 Artist Danny Yung with designs for the flower plaque in his Hong Kong studio. 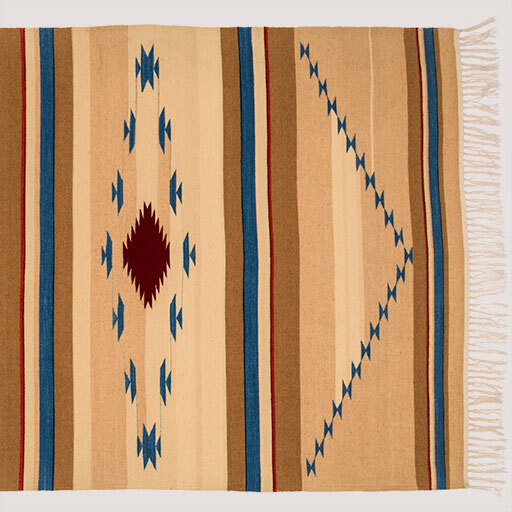 Santa Clara Pueblo, New Mexico, U.S.A. 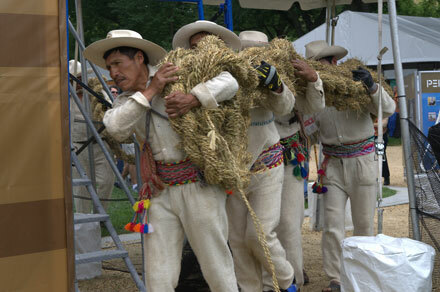 The 1992 Folklife Festival commemorated the Columbus Quincentenary, providing an opportunity to reflect on the profound forces that shaped life in the Americas over the preceding 500 years. For the New Mexico program, participants representing Native Americans, early Hispanic settlers, and later immigrants came together to discuss the complex underpinnings of the state’s robust regional culture and land-based lifeways that are anything but unchanging. Santa Clara Pueblo pottery was one of the traditional arts featured in the program and was set up in a large plaza surrounded by adobe structures. 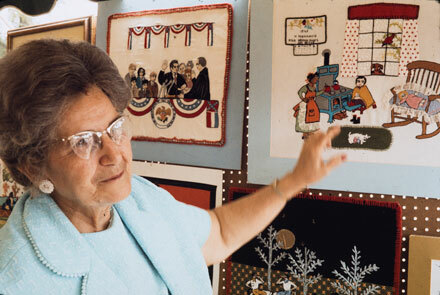 Madeline Naranjo was born in 1916. She traveled to Washington with her daughter Frances, also a potter, and Tessie Naranjo (unrelated), who wrote about pottery in the Festival program book and helped present their work on the National Mall. The pottery area included works in progress and a display of the deeply etched and beautifully burnished pottery for which Santa Clara potters are so well known. 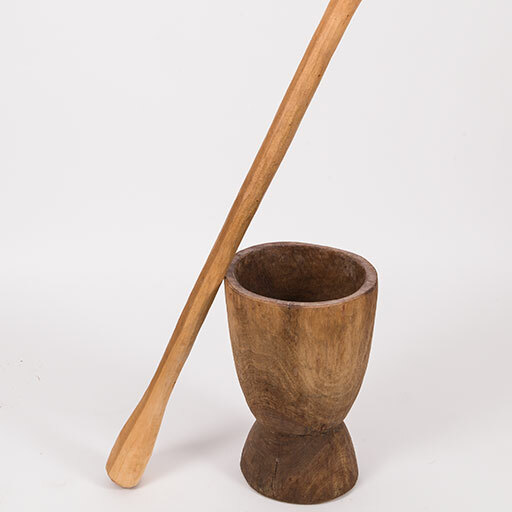 Close observers could learn that the lustrous sheen on the surface is achieved by carefully polishing with a small, smooth stone after the pot is formed and carved. 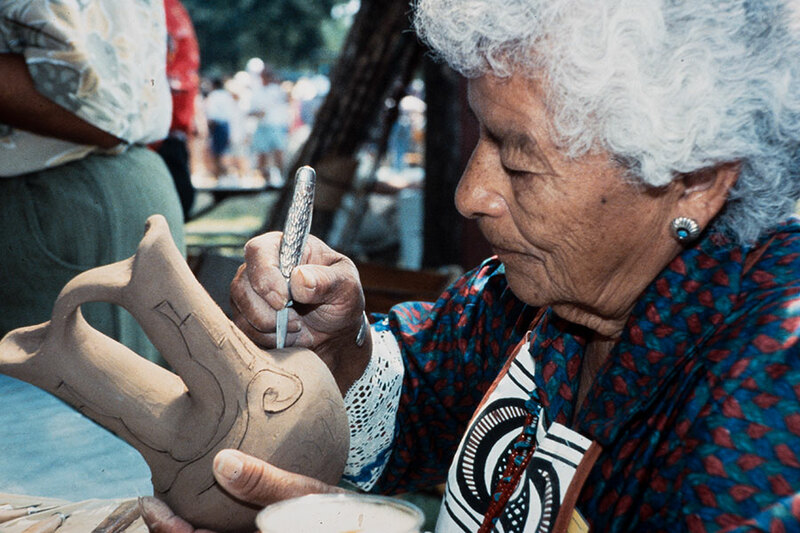 Madeline Naranjo finishes a carved jar at the 1992 Festival. Pueblo pottery—in its many forms, colors, and surface design techniques—has drawn collectors since the late nineteenth and early twentieth centuries when the railroad and later automobiles brought tourists into the Southwest. A local craft art economy grew and remains strong today. The Festival had a robust Marketplace that year, including this beautiful bowl. 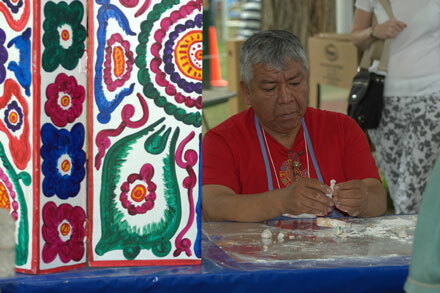 Madeline Naranjo carves designs into a wedding vase at the Festival. Established by Congress in 1846 to promote the increase and diffusion of knowledge, the Smithsonian celebrated its sesquicentennial in 1996. 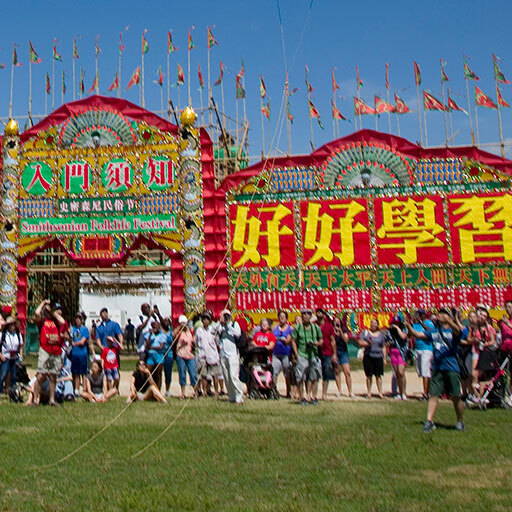 To mark the occasion, the Center for Folklife and Cultural Heritage organized and produced the Institution’s 150th birthday party, which attracted 600,000 celebrants on August 10 and 11. August 10, 1846, was an eventful day in Washington, D.C. The U.S. Congress enacted legislation to establish the Smithsonian Institution, and President James K. Polk signed the bill that same day. The Institution’s centennial in August 1946 saw only a small exhibition inside the National Museum of Natural History, so hopes were high for something bigger to mark the sesquicentennial in 1996. Many Smithsonian staffers were initially unenthusiastic. It would be terribly hot in August, Congress would be in recess, and it would cost a lot of money. Nevertheless, the Center for Folklife and Cultural Heritage, which already had some thirty years’ experience producing the Folklife Festival, agreed to take on the task. Since the early 1990s, the Center has produced a number of large-scale special events: America’s Reunion on the Mall in conjunction with President Bill Clinton’s 1993 inauguration; Southern Crossroads: A Festival of the American South celebrating the 1996 Olympic Games in Atlanta; National World War II Reunion in honor of the National World War II Memorial dedication in 2004; First Americans Festival concurring with the National Museum of the American Indian opening in 2004; and Freedom Sounds: A Community Celebration for the opening of the National Museum of African American History and Culture in 2016. 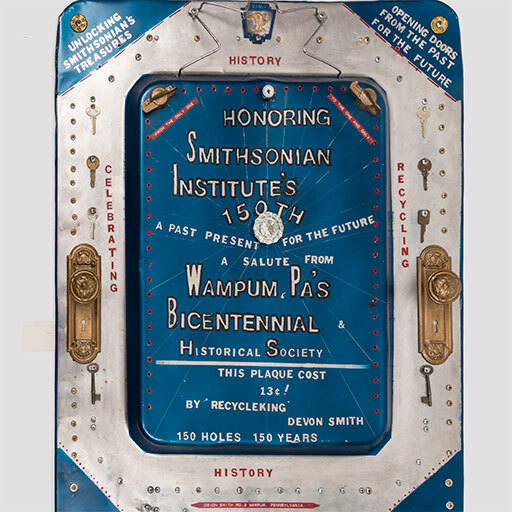 Among the gifts received by the Smithsonian for its 150th birthday was this commemorative plaque, created by DeVon Smith (1926–2003) of Wampum, Pennsylvania, which coincidentally was celebrating its bicentennial in 1996. Smith was born five miles from Wampum and served in the U.S. Army during WWII. In 1947, he began a career of professional hitchhiking. He set records for the fastest time to hitch in all 48 states (33 days) and for the most cumulative miles (290,980). In the 1970s, he returned to Wampum, where he bought and sold scavenged items—such as the materials for this plaque, which cost Smith a total of 13 cents. 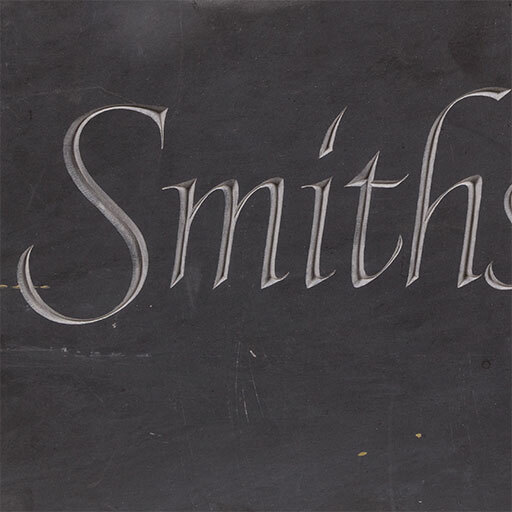 Painted on the plaque are the words, “Opening doors from the past for the future,” which pay tribute not only to the Smithsonian, but also to Smith’s own creative spirit. Matachines dancers perform in front of the cross on the Mall. The matachines dance is a folk Catholic tradition that honors various saints, religious icons, or liturgical feast days. 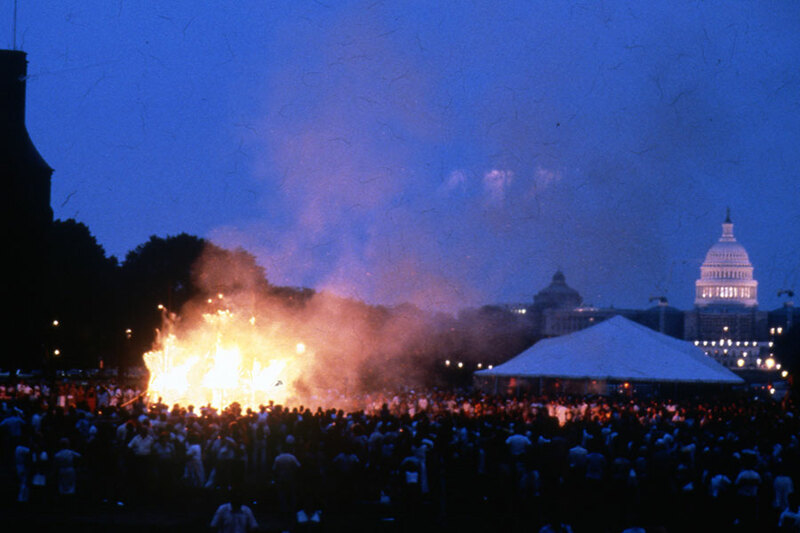 During the 1987 Folklife Festival, the Matachines de la Santa Cruz de Laredo, Texas, honored the Holy Cross with a procession down the National Mall. Organizer, embroiderer, and dancer Teresita González proudly danced at this once-in-a-lifetime event with the nagüilla, or skirt, embroidered for this occasion with the emblems of the cross and chalice. The nagüilla was trimmed with three tiers of bangles strung with jingle bells and pieces of river cane gathered from the banks of the Rio Grande/Río Bravo. In addition to being a personal identity marker, the nagüilla—with its bells and reeds—is an instrument. Listen to the sounds of the nagüilla as the Matachines troupe from Laredo, Texas moves through the Festival site. The troupe followed a decorated cross down the Mall, forming dance patterns in time to the persistent rhythms of the accordion and drum. The ringing bells and clanging of the reeds on the nagüillas accentuated the sounds. Each dancer also shook a gourd rattle. The cadence of the music and energetic stepping drew visitors from across the Festival who eagerly followed the procession. A young family member works on the nagüilla. Traditions can be powerful enough to link oceans. 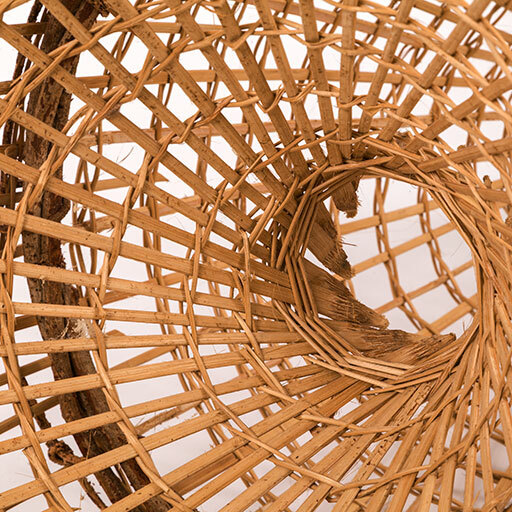 These coiled baskets created by African American basket sewers from the Low Country of South Carolina are part of a deep and unbroken connection to African heritage that dates from the 1700s. 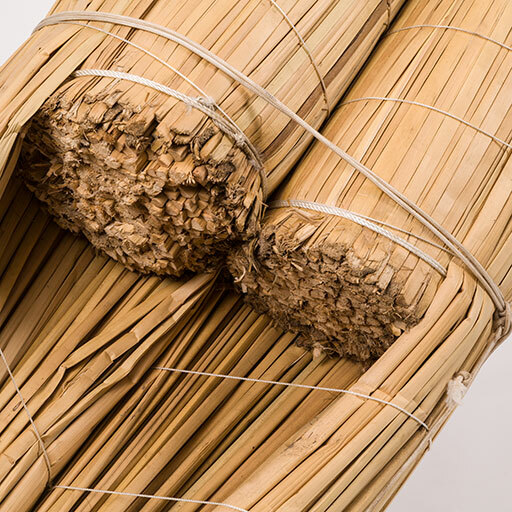 Experienced African farmers enslaved and forced to work in American plantations brought the tradition of coiled sweetgrass basket making to the United States as part of a broader repertoire of farming knowledge and expertise. 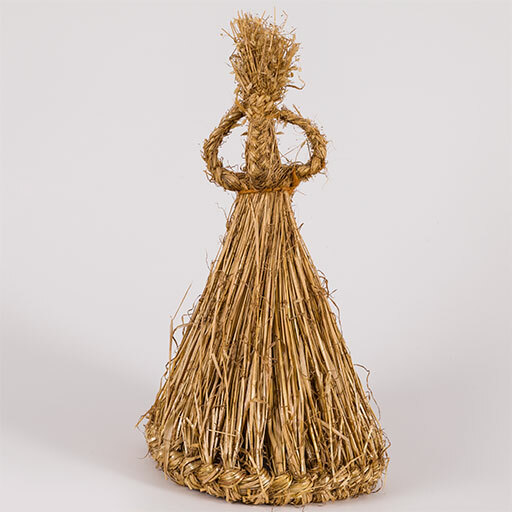 Baskets were originally created from locally available materials such as bulrush, palmetto, and sweetgrass to winnow rice, hold food, and transport cotton. With diminishing use of baskets in farming, basket sewers in South Carolina continued to make and use baskets for their homes, and eventually to offer them for sale to tourists at outdoor markets. In the 1920s, heritage craft schools such as Penn Center taught these traditional arts as a valuable occupational skill. 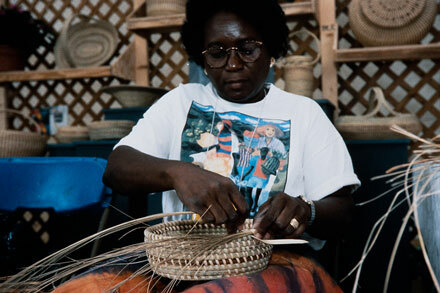 National Heritage Fellow Mary Jackson and Melissa Darden demonstrated the art of Low Country basket sewing at the 1996 Folklife Festival’s American South program. The baskets in the Center’s collection were made for sale in the Festival Marketplace by Marguerite S. Middleton, another well-known basket sewer. Supporting traditional artists by marketing and selling their work was an early hallmark of the Folklife Festival. 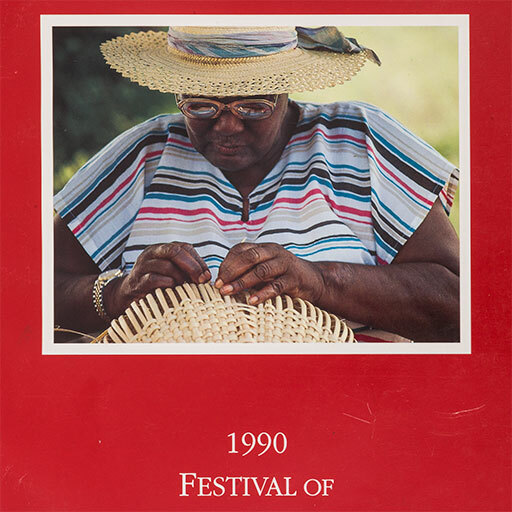 The 1976 program on the African Diaspora, in fact, was one of the first places sweetgrass baskets were available for purchase outside of the South. At the time, most of the baskets were sold from outdoor stalls along Route 17 in Mount Pleasant, South Carolina. Detail of one of Marguerite Middleton’s baskets. 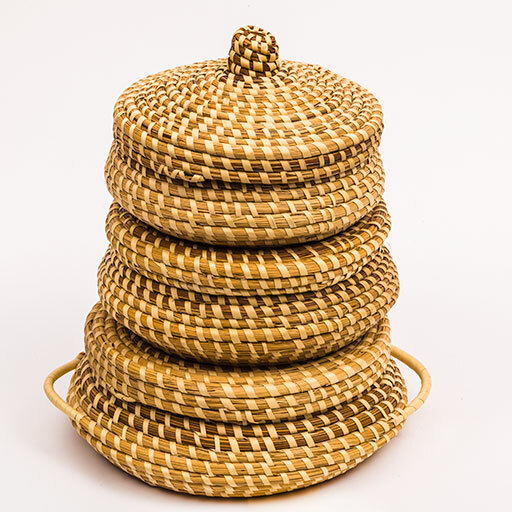 As recognition of the tradition’s connections to African heritage and its role in American history has grown, so has the demand for the baskets and their growth into an art form. 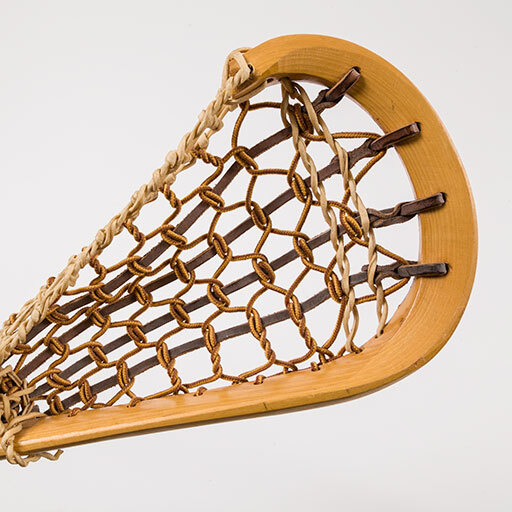 In a move to protect the source of their weaving materials, basket makers formed the Mount Pleasant Sweetgrass Basketmakers Association to protect the wild sweetgrass. 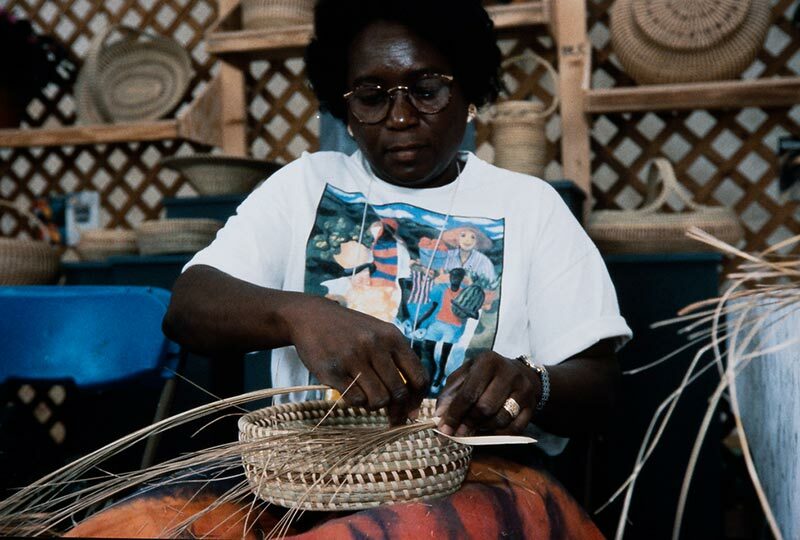 The members work together to keep the tradition alive, advocate for fair prices, and maintain high standards of African American basket making. These skills are passed on in African American families throughout the Low Country of South Carolina, and the baskets have been become a source of both income and creative expression. They are forceful reminders of an enduring African American history and heritage. Along with Mary Jackson, Melissa Darden demonstrated sweetgrass basket sewing at the Festival.